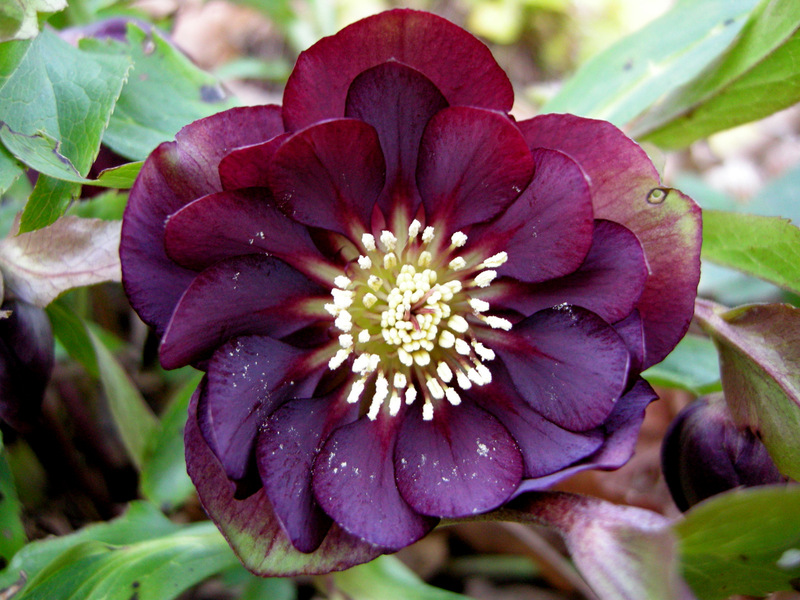 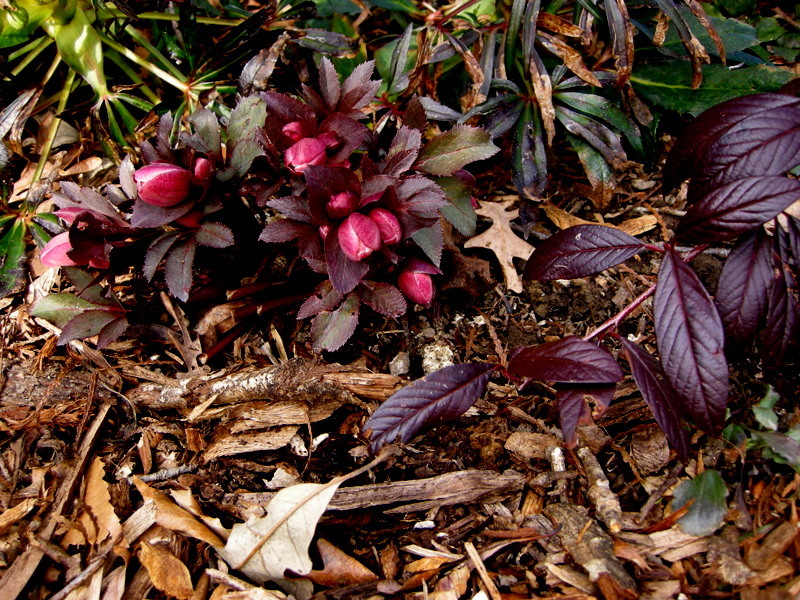 ‘Anna’s Red’, a new addition to the FrostKiss™ hellebore family. 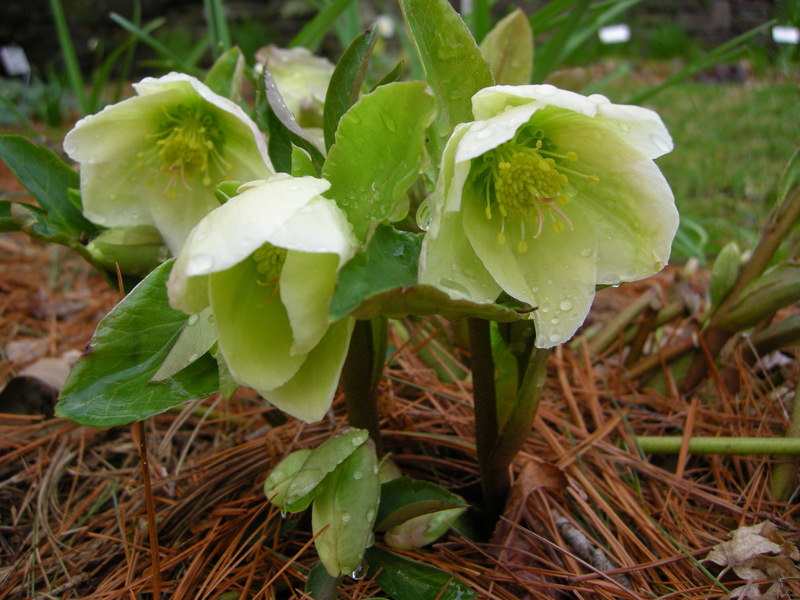 All my customers have been commenting that their hellebores are spectacular this year. 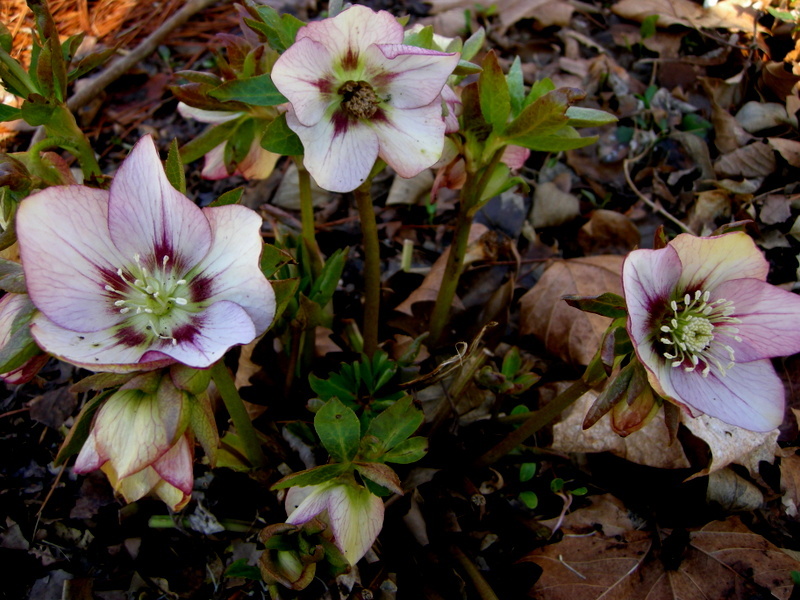 Mine are too, and I thought it would be fun to show you photos of hellebores in my garden today. 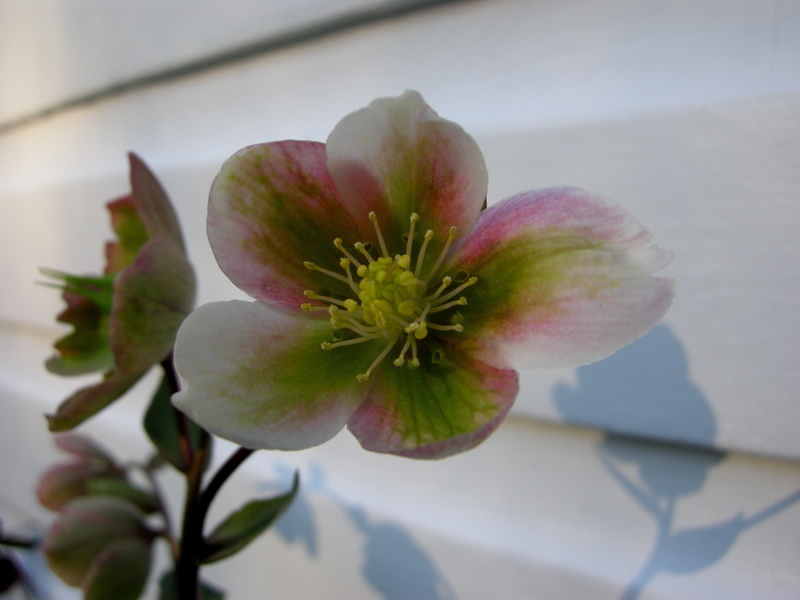 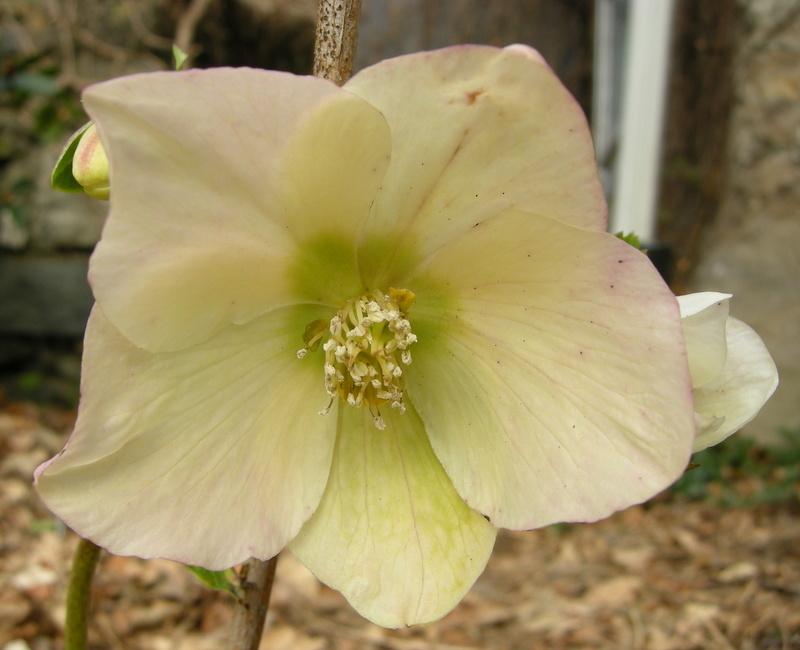 Although I have hundreds of hellebores in bloom, I have limited the photos to hellebores that will be available for sale at the Carolyn’s Shade Gardens open house sale this Saturday, April 14, from 10 am to 3 pm. 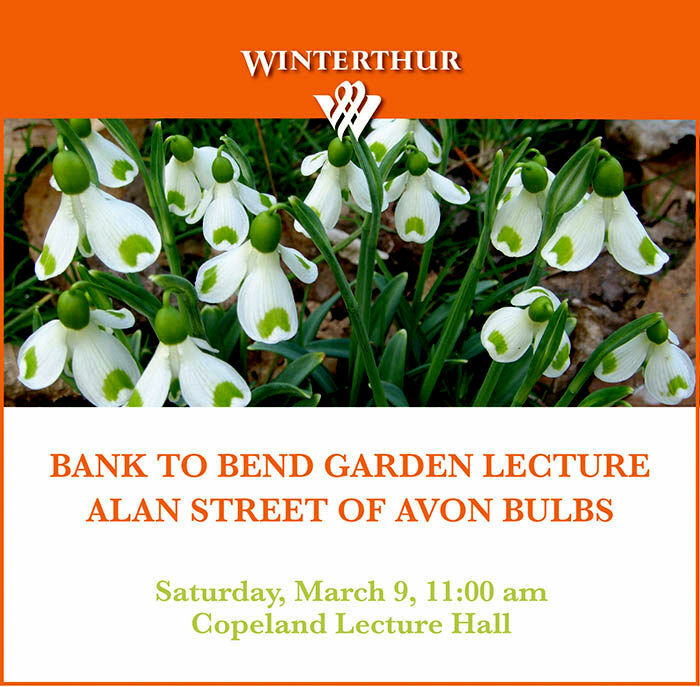 If you can’t come on Saturday, I still have appointments available on Friday, April 13, on the hour and half hour from 10:30 to 5—just email me, carolyn@carolynsshadegardens.com, your top three choices, and I will confirm. 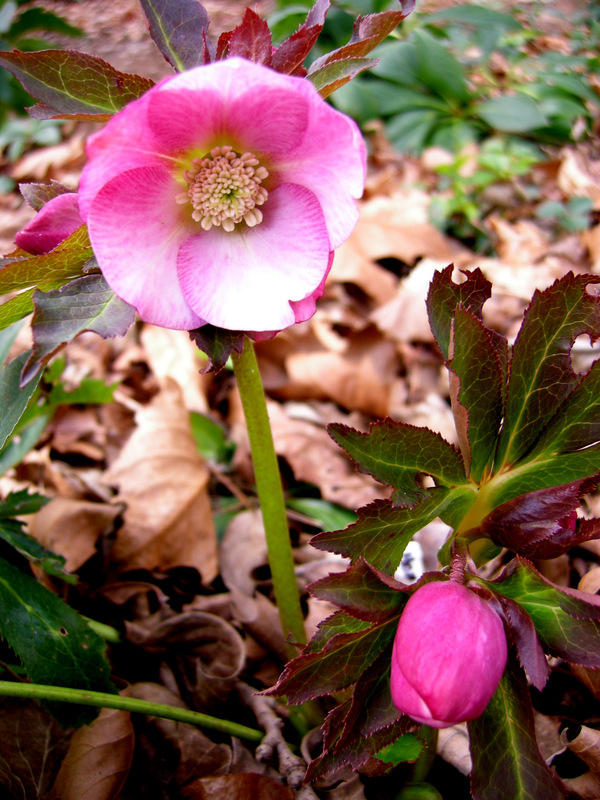 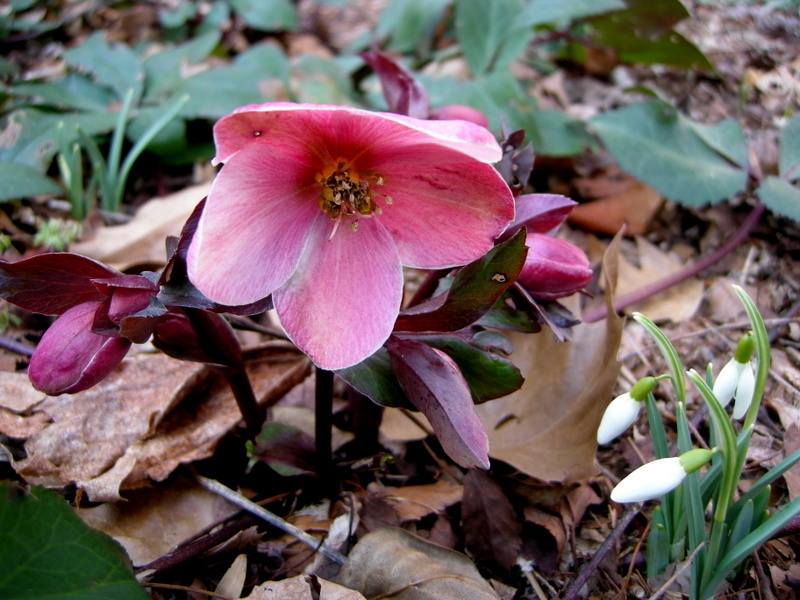 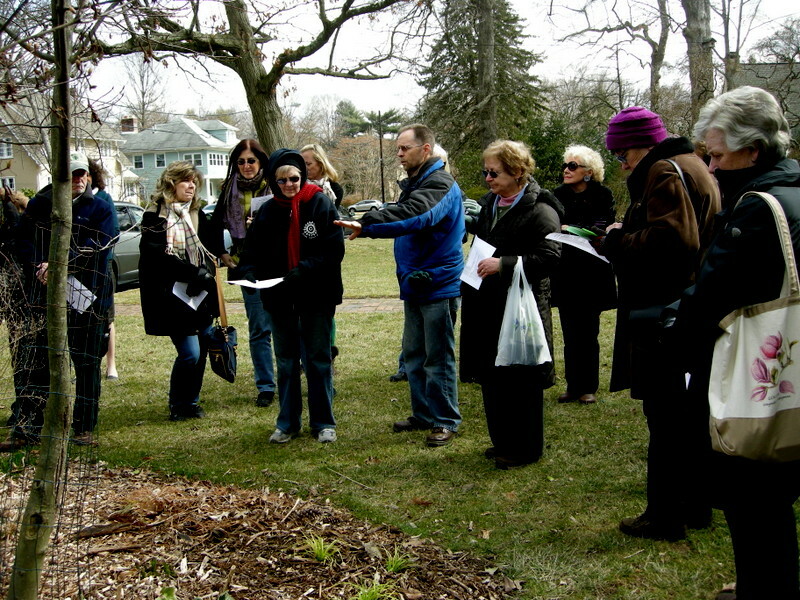 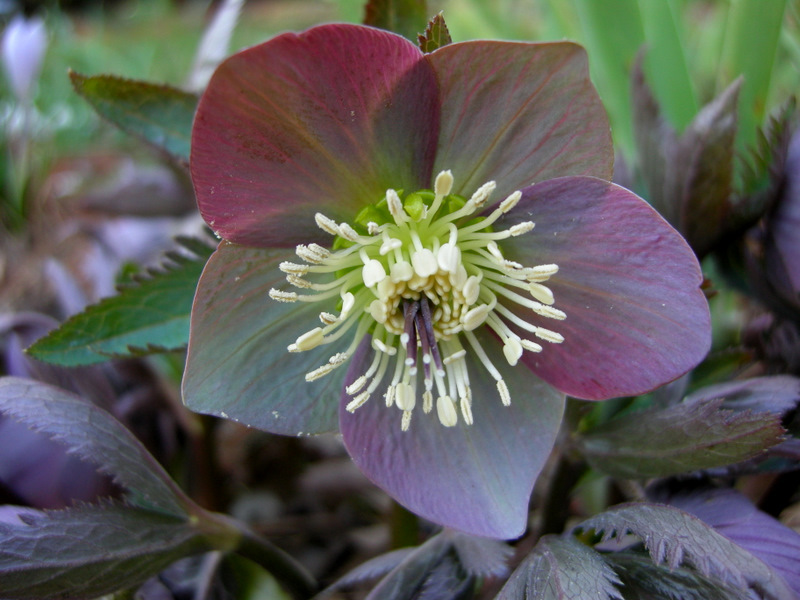 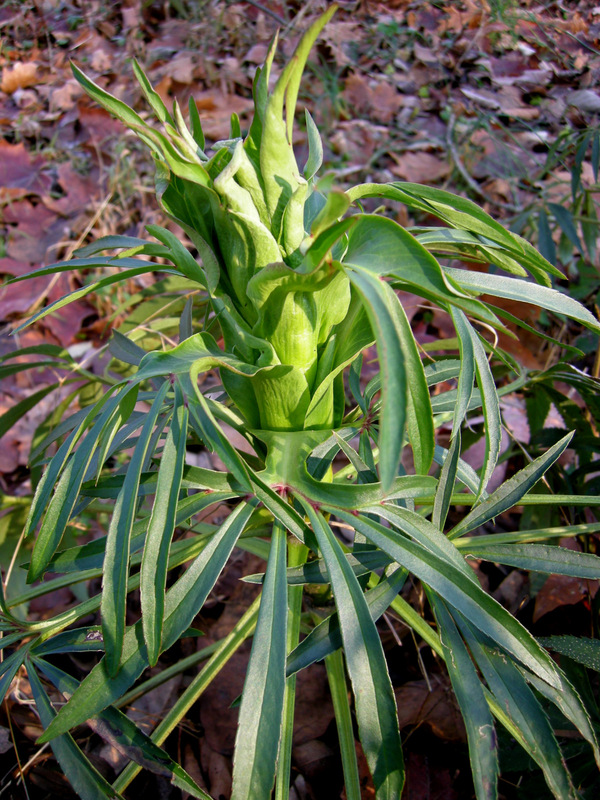 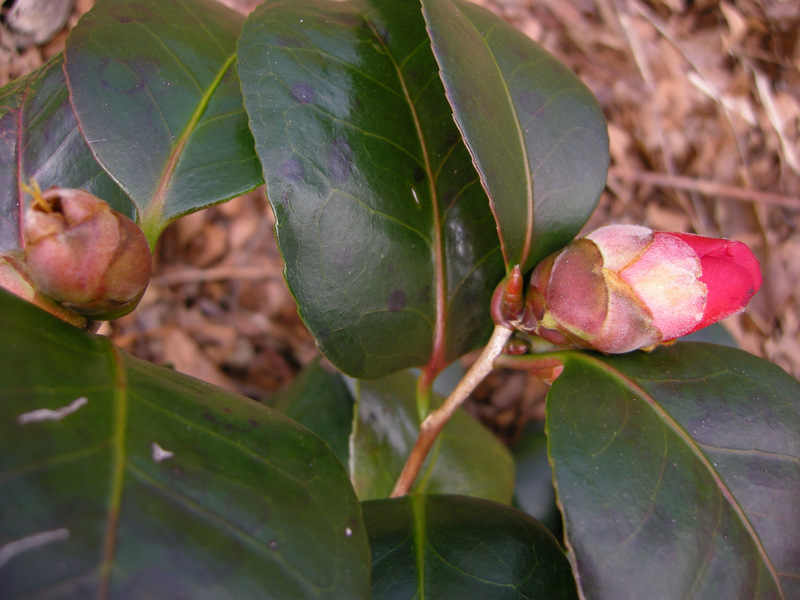 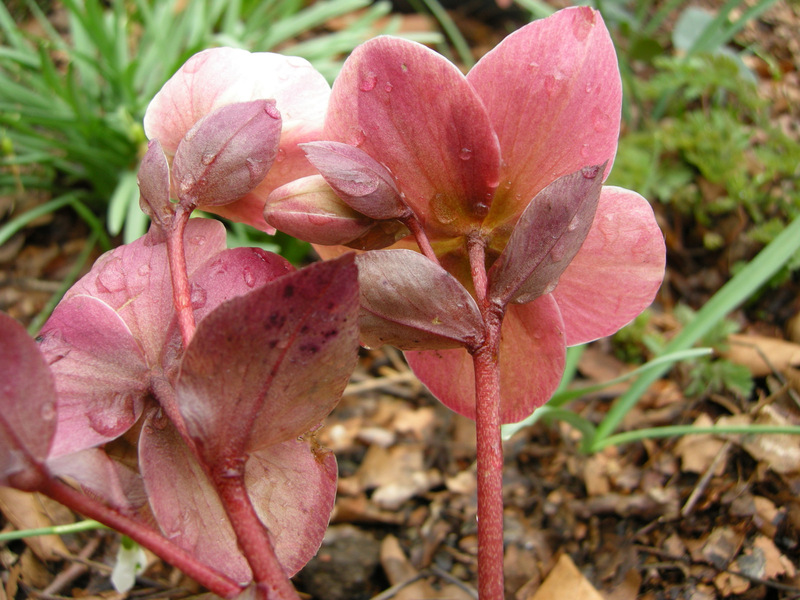 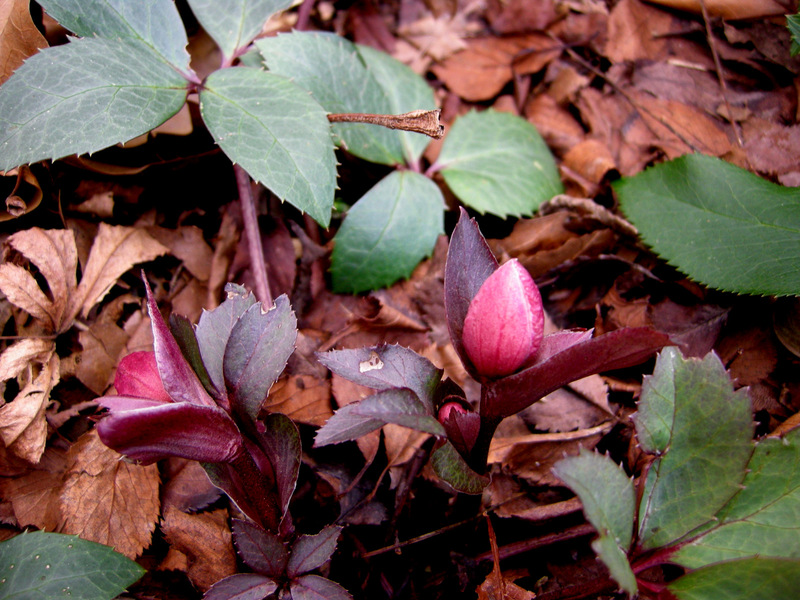 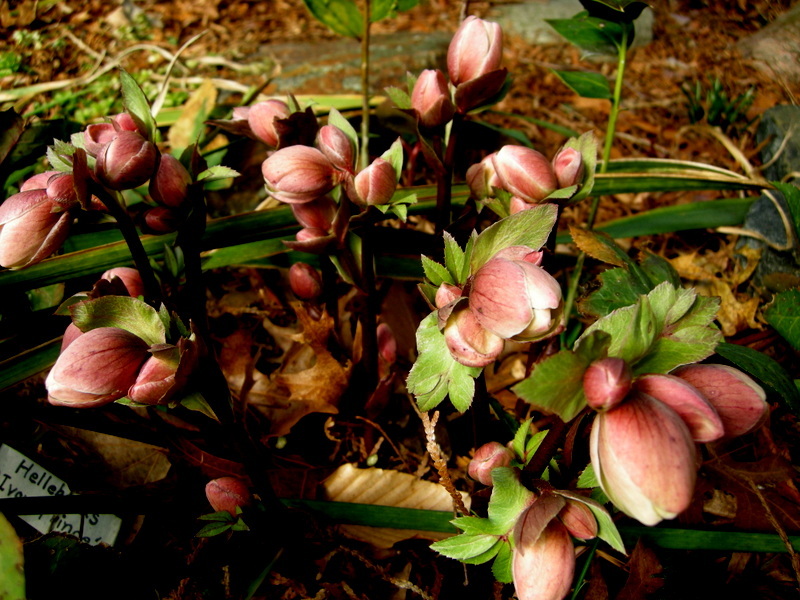 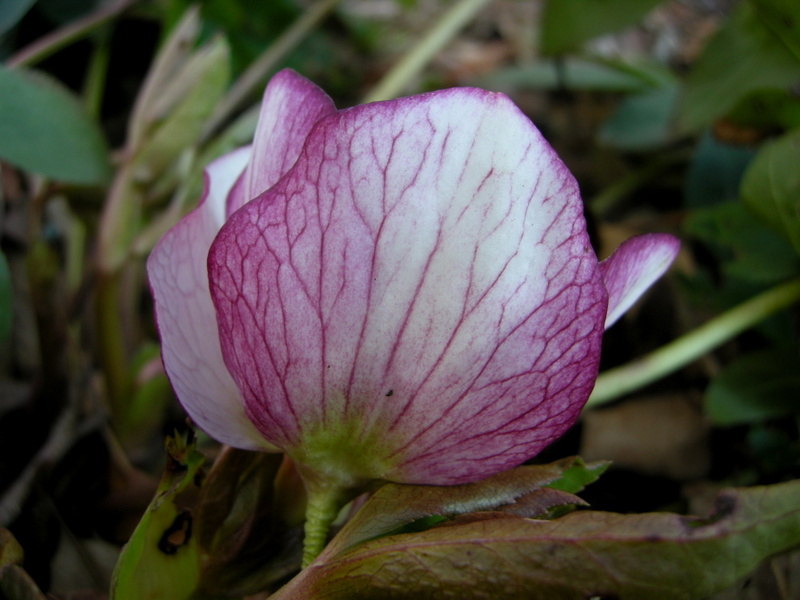 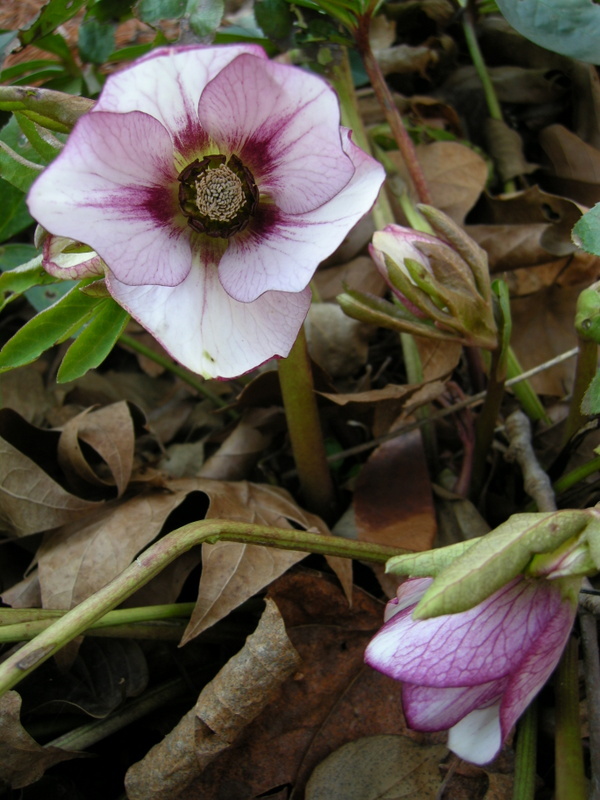 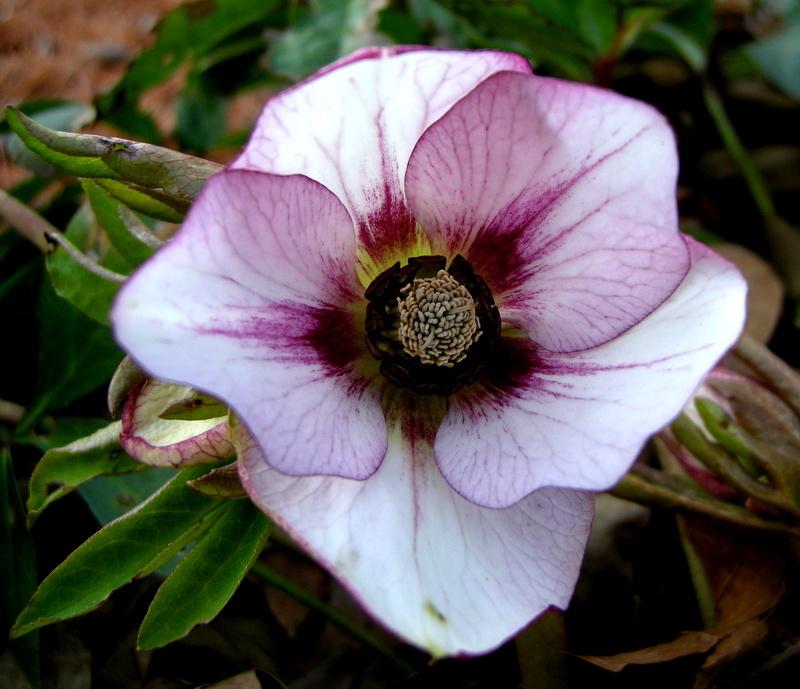 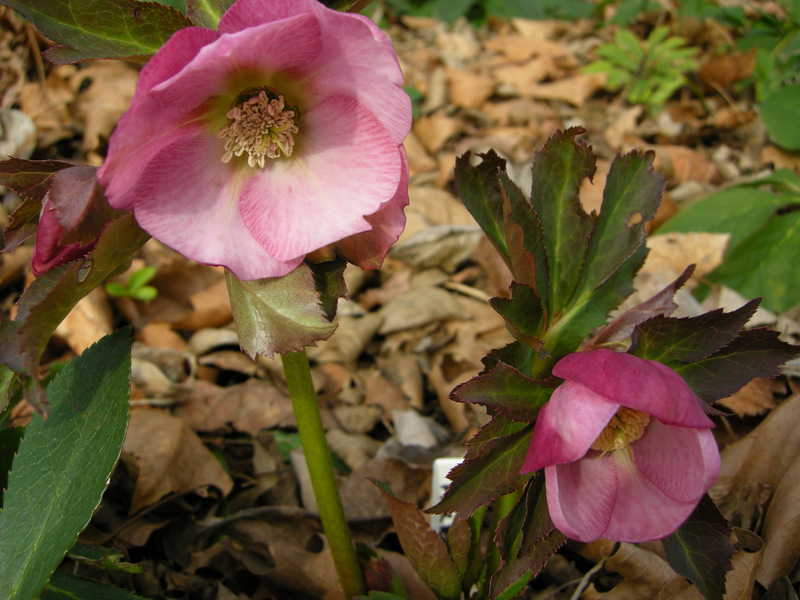 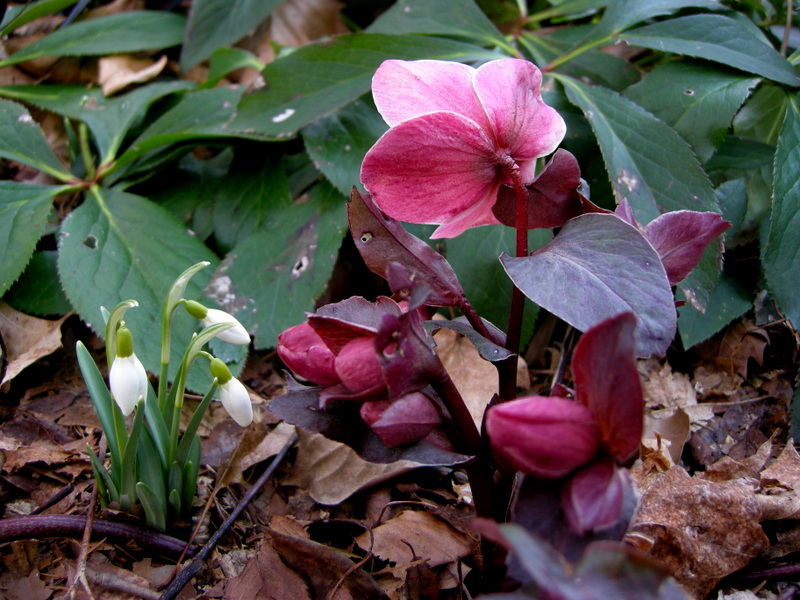 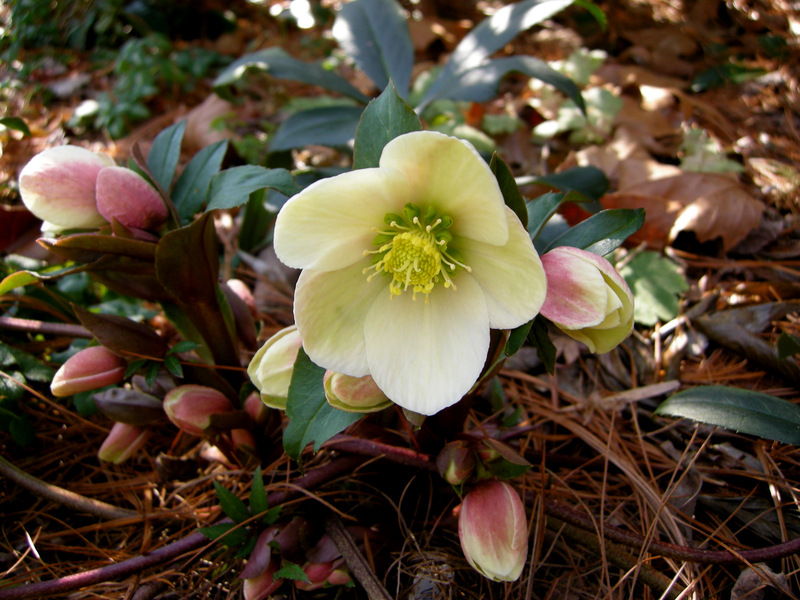 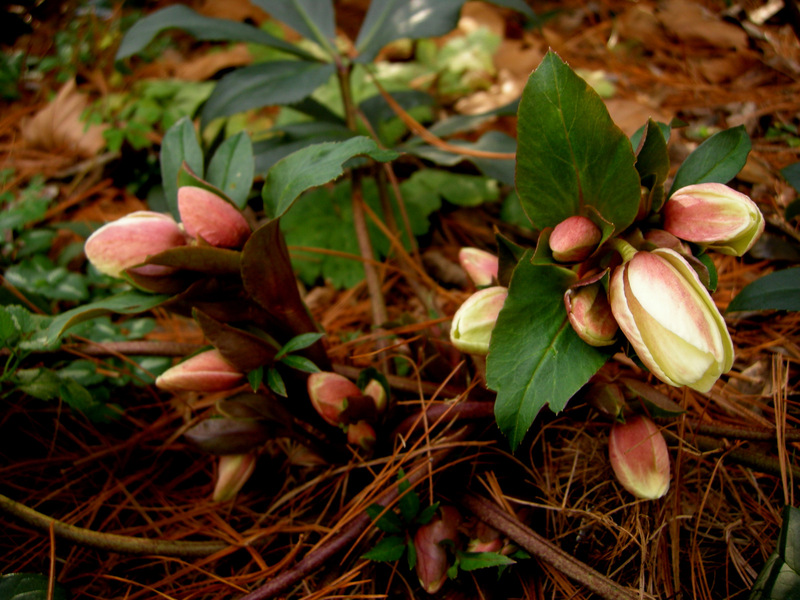 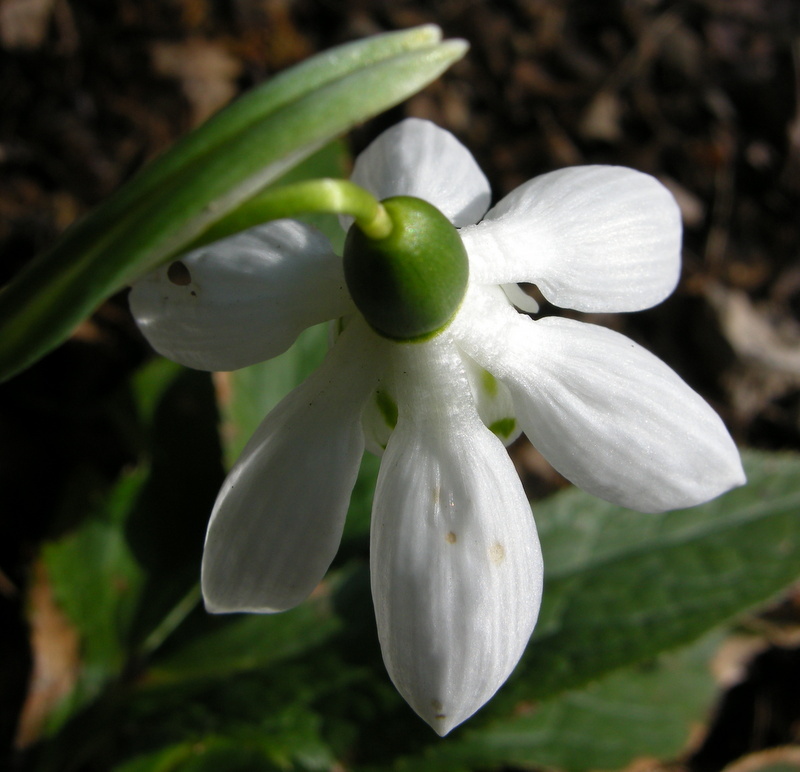 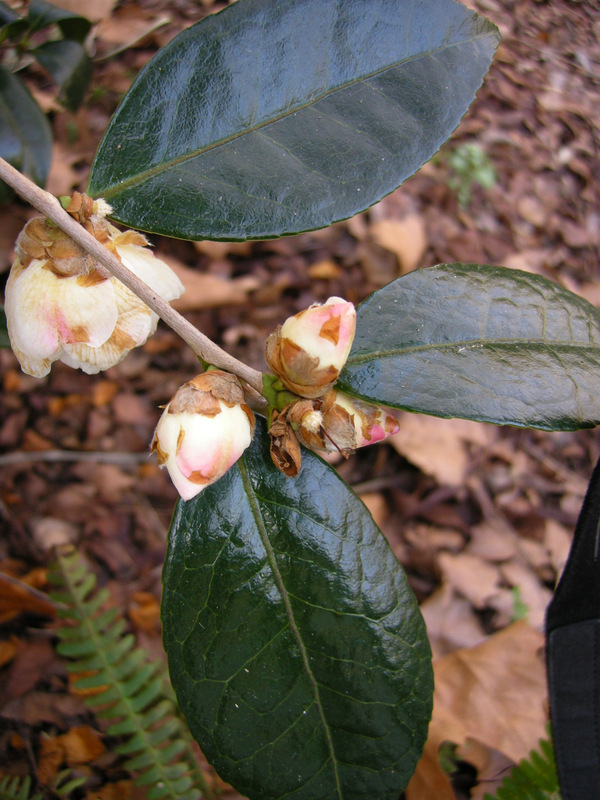 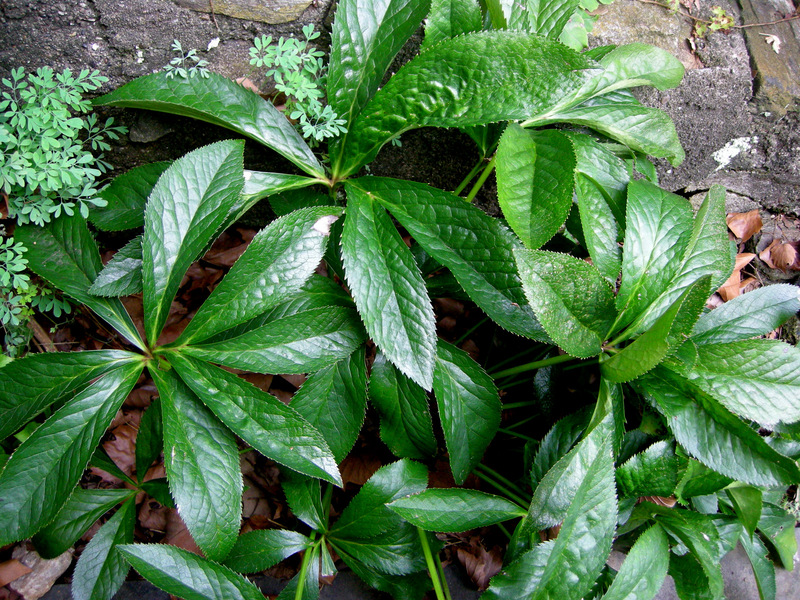 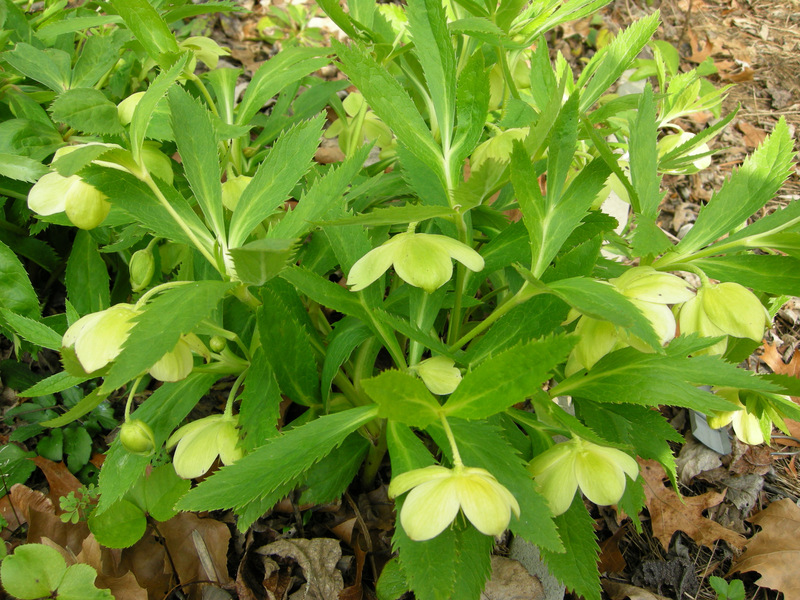 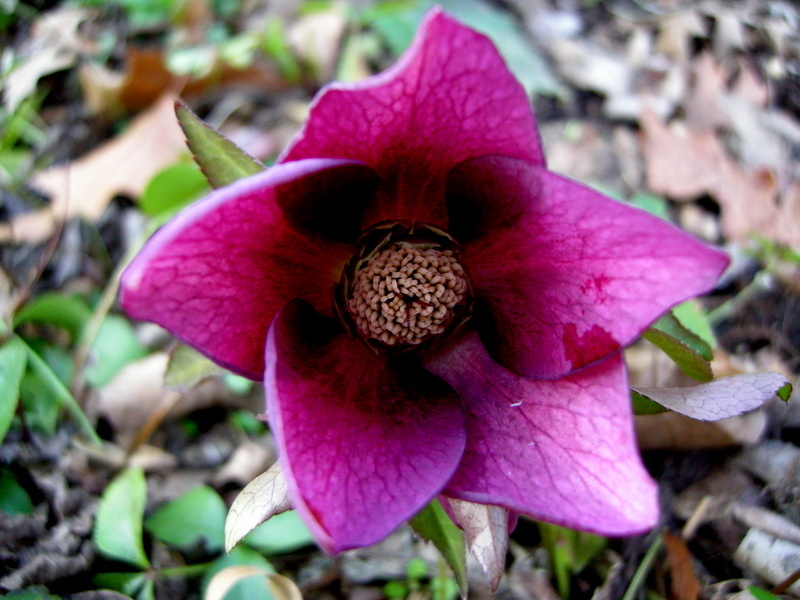 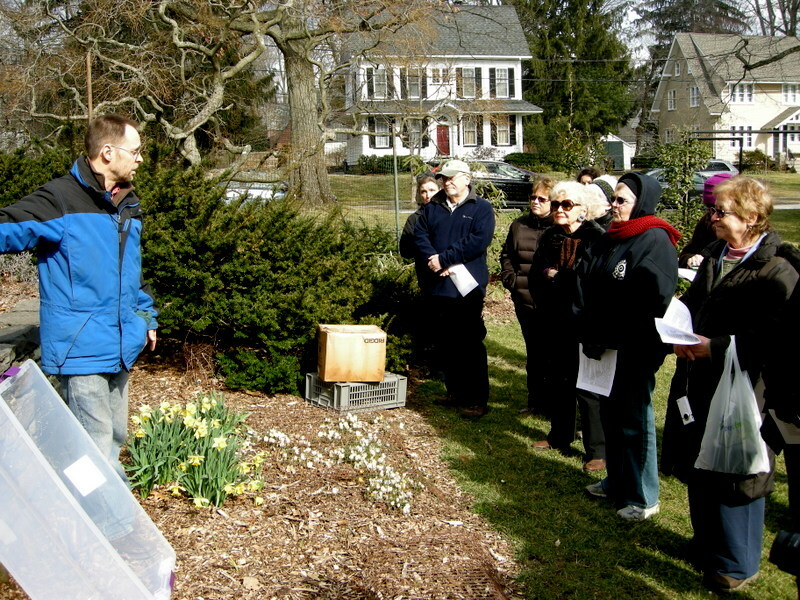 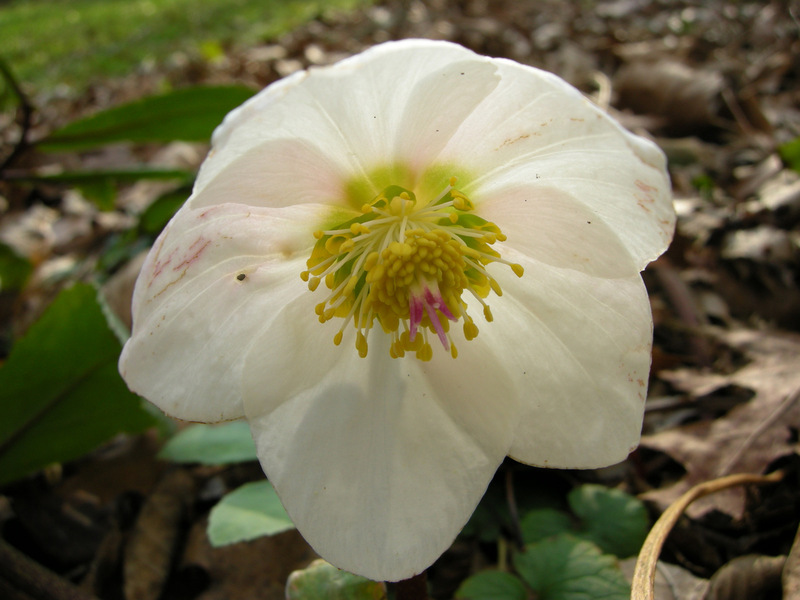 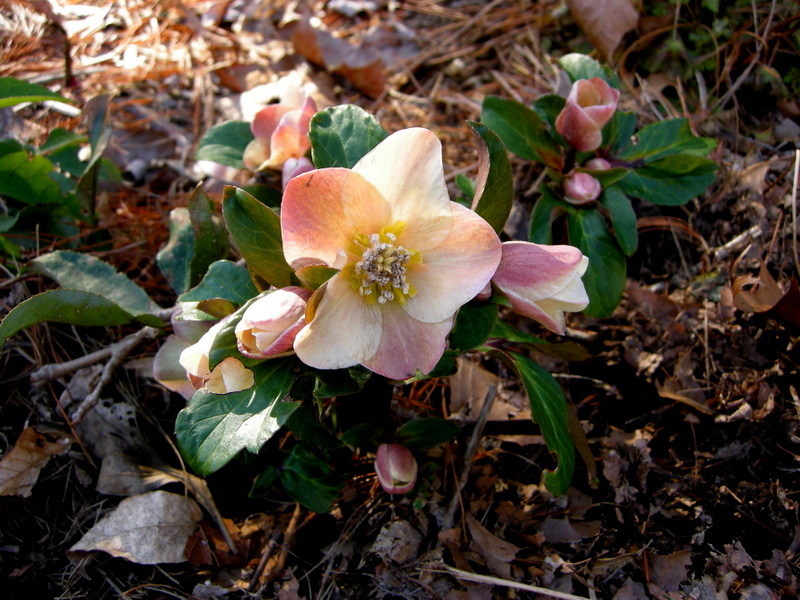 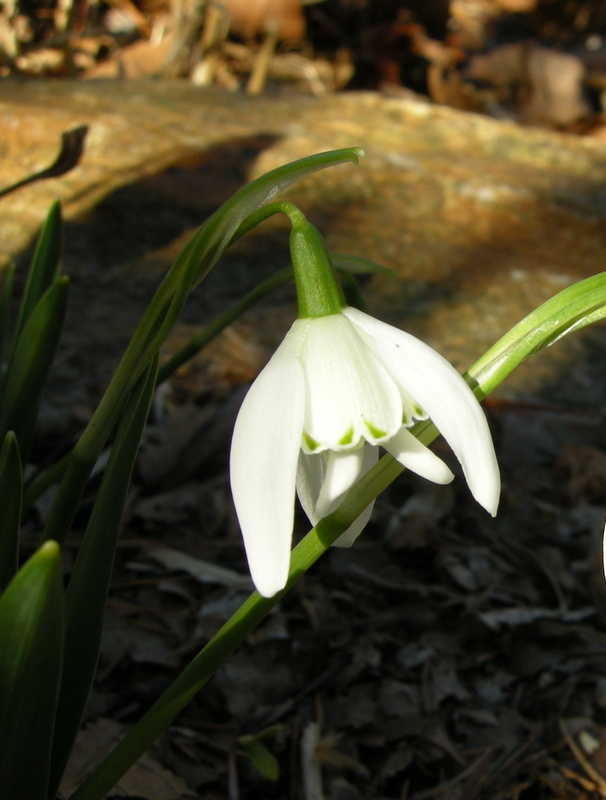 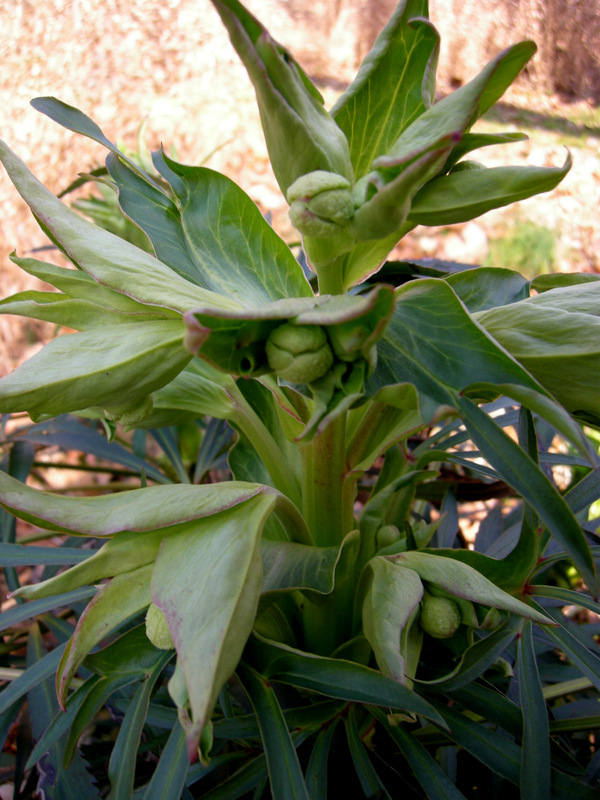 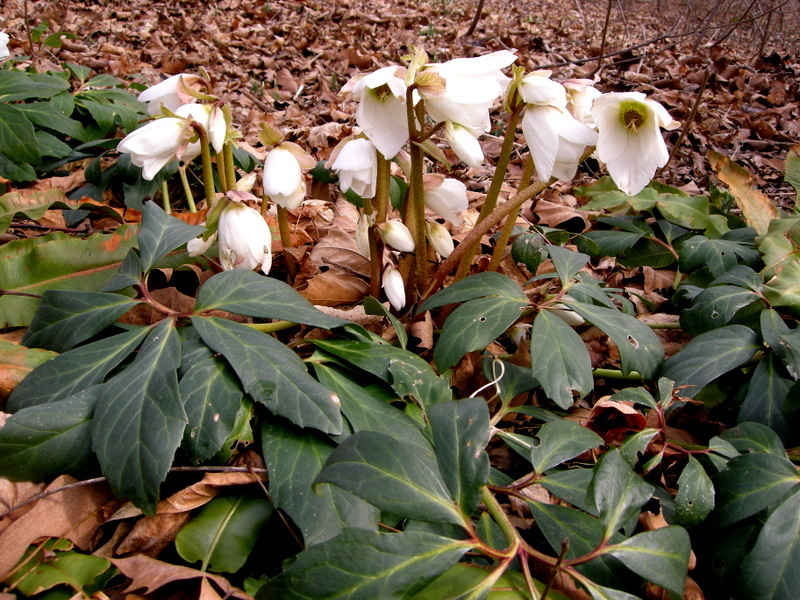 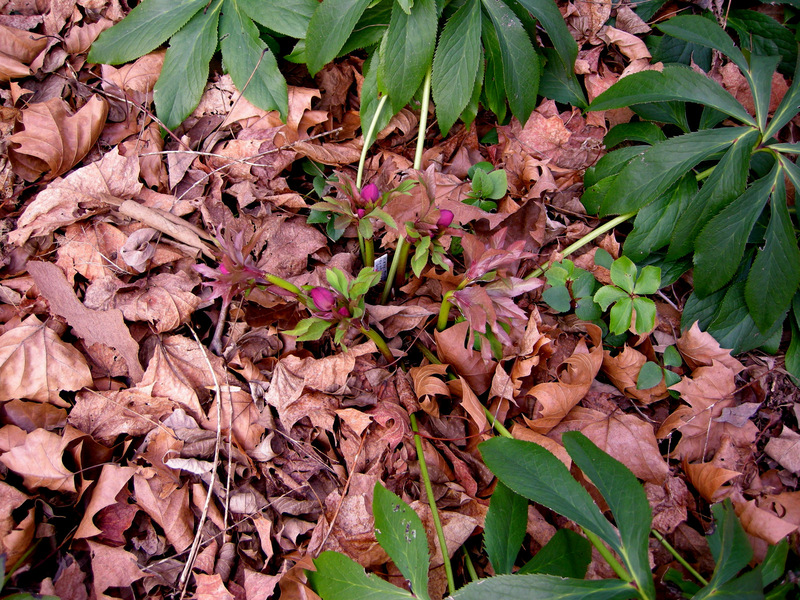 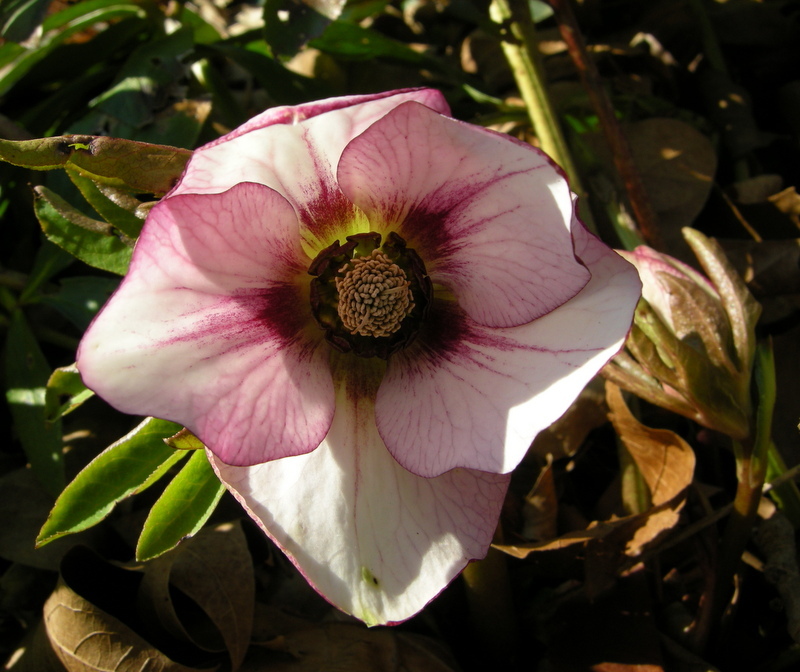 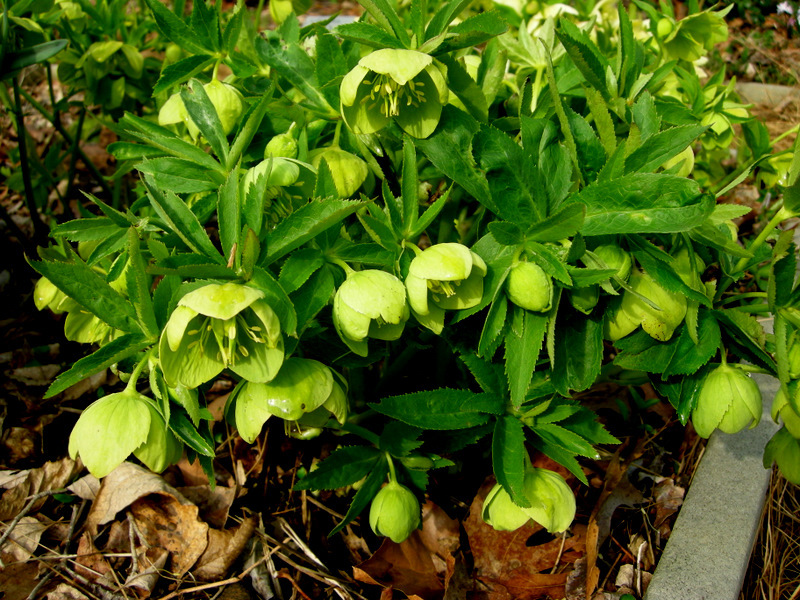 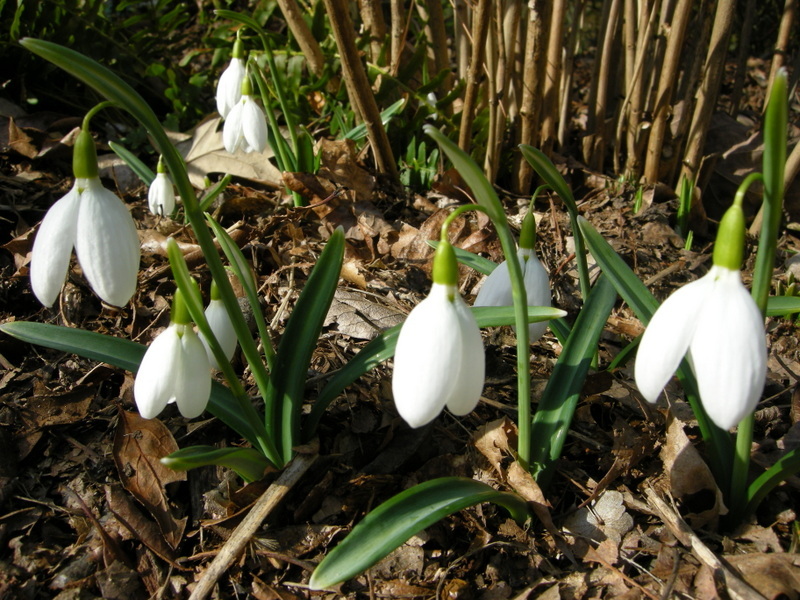 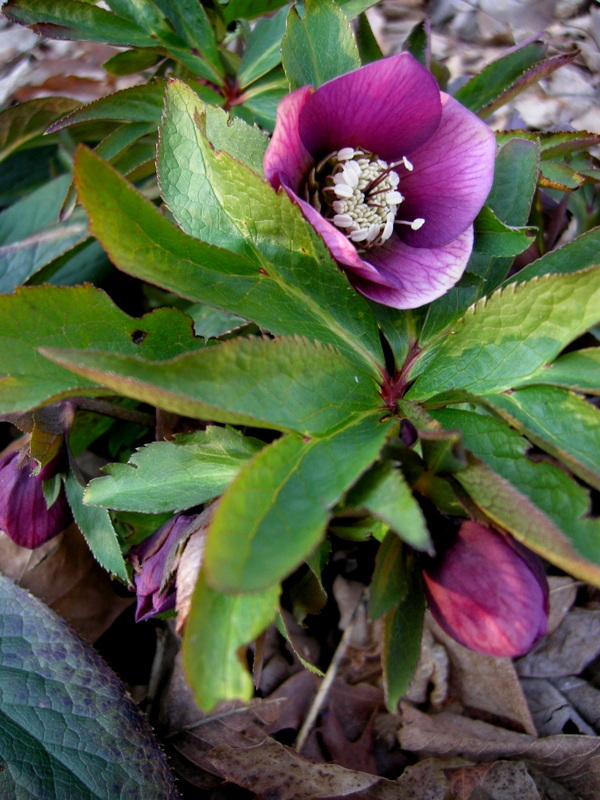 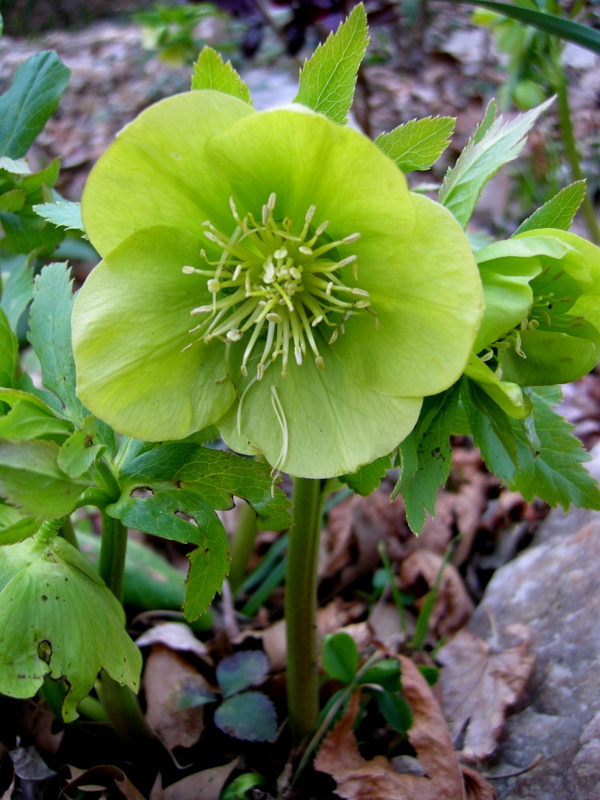 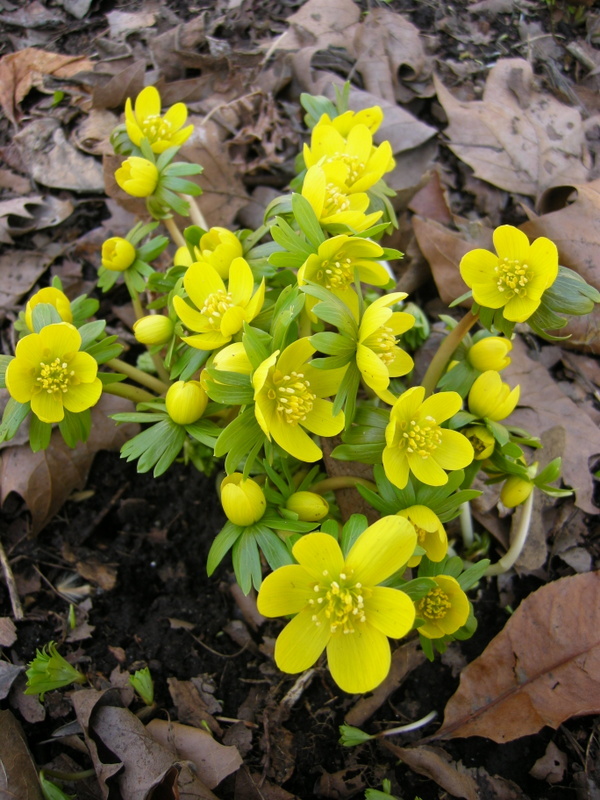 Nursery News: Our first open house sale featuring hellebores, early spring-blooming shade plants, and native plants is this Saturday, April 14, from 10 am to 3 pm. 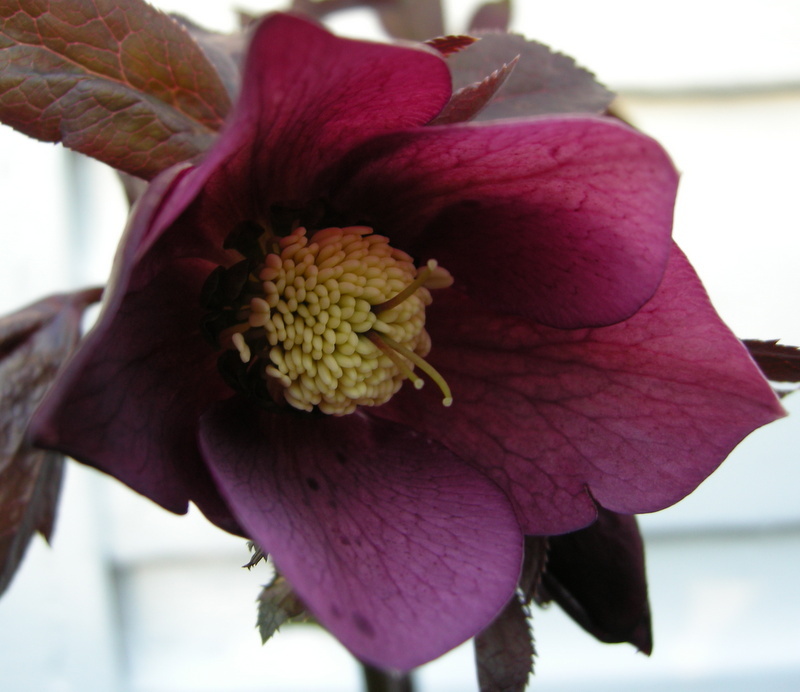 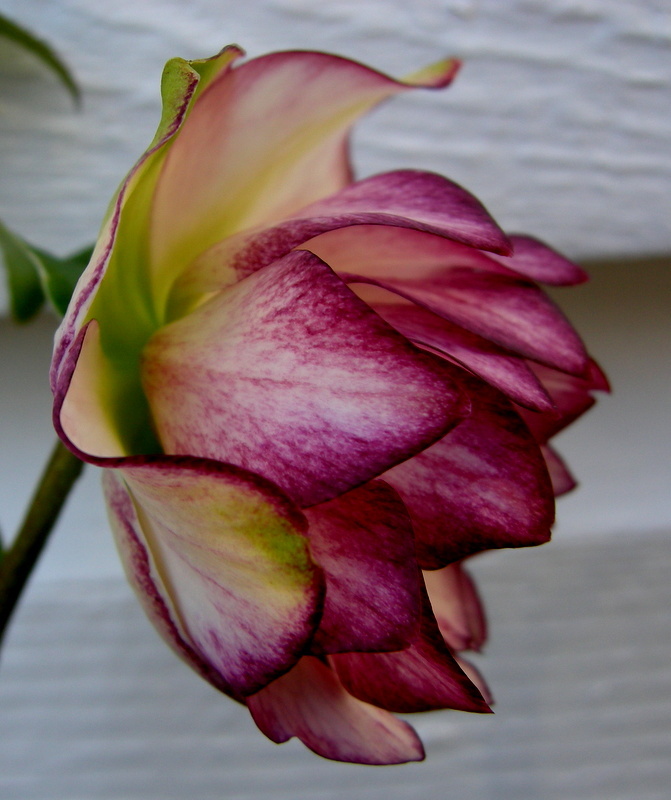 ‘Dorothy’s Dawn’, another 2018 addition to the FrostKiss™ line of hellebores, has beautiful flowers, but what I really love is…. 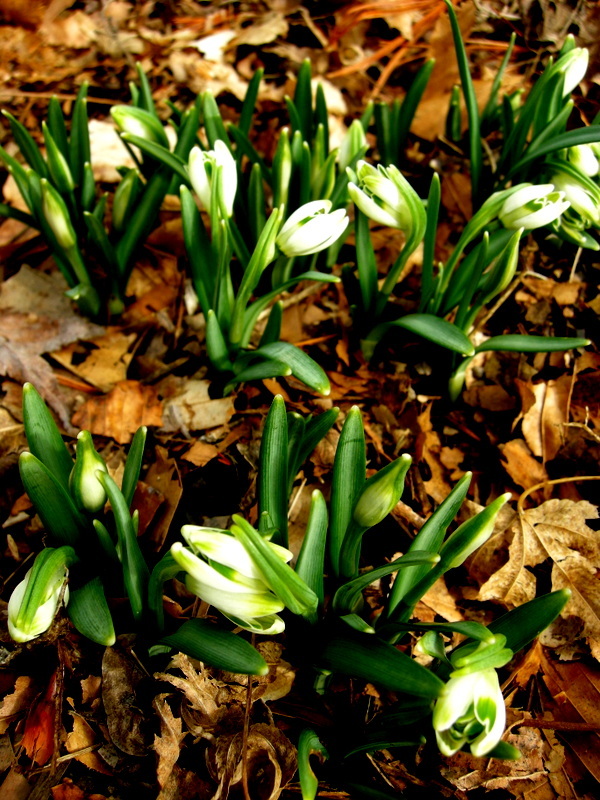 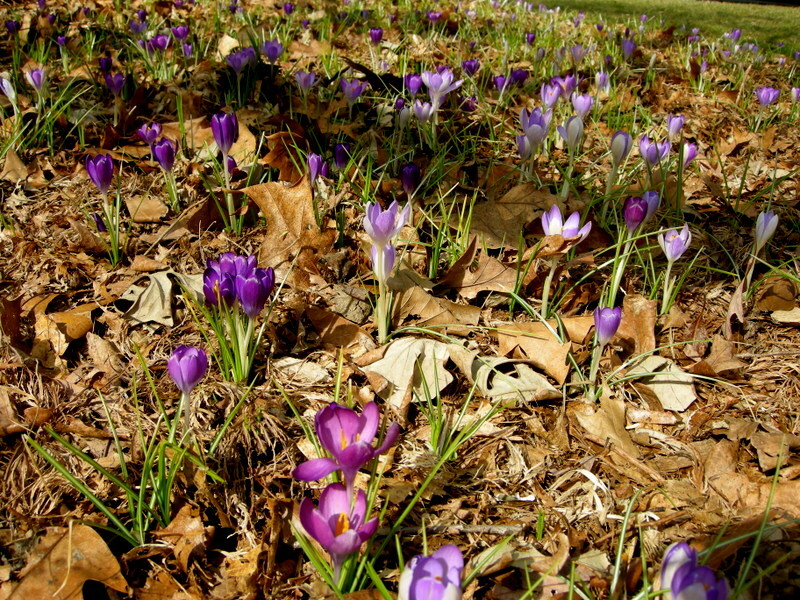 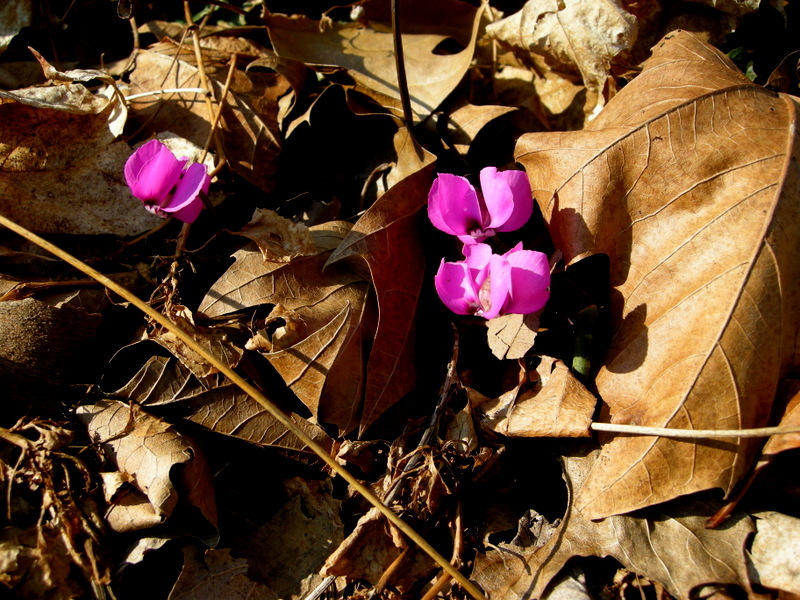 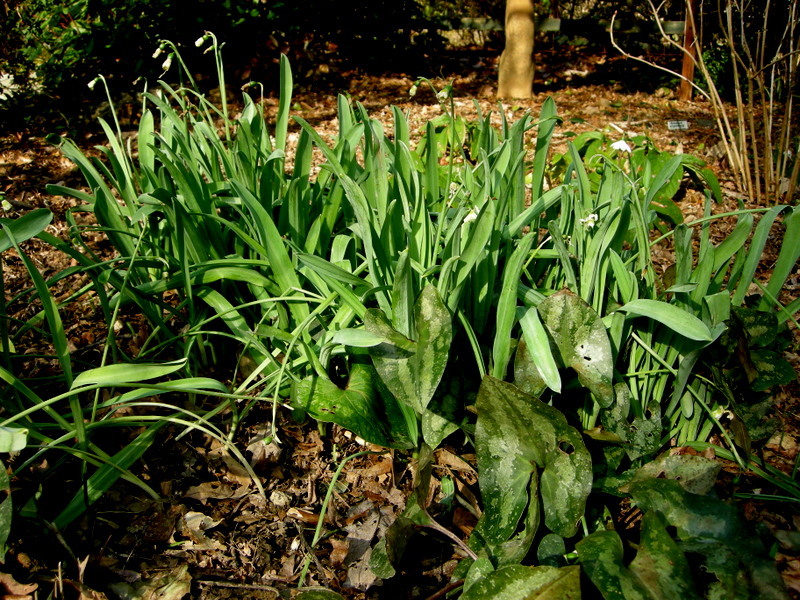 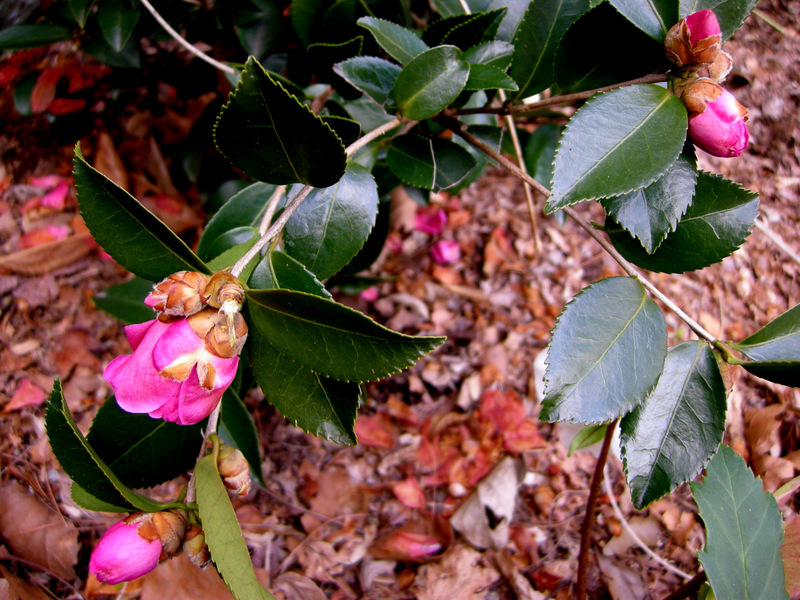 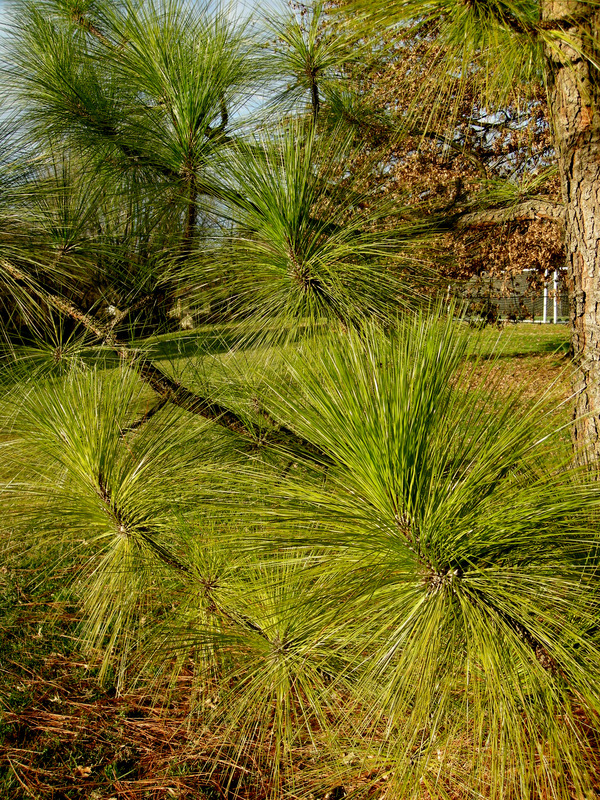 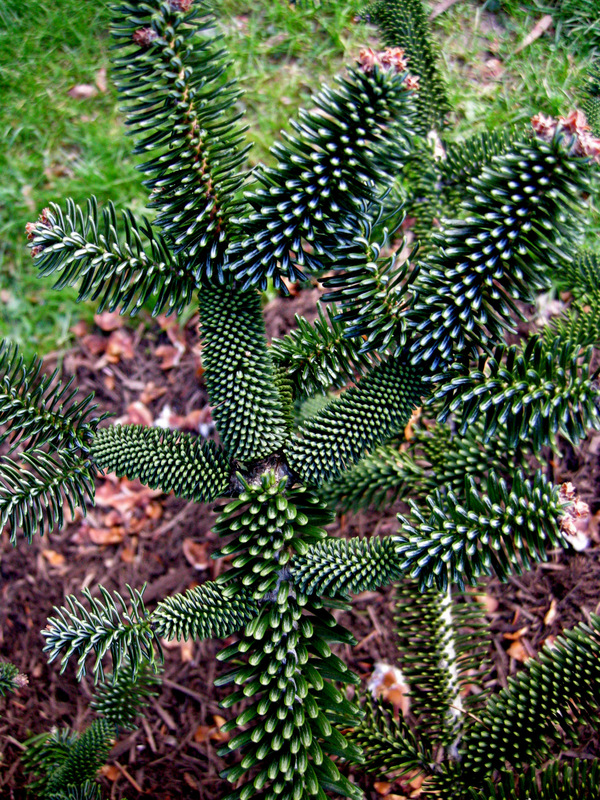 ….the leaves, which, like all FrostKiss™ foliage, lasts all winter into spring. 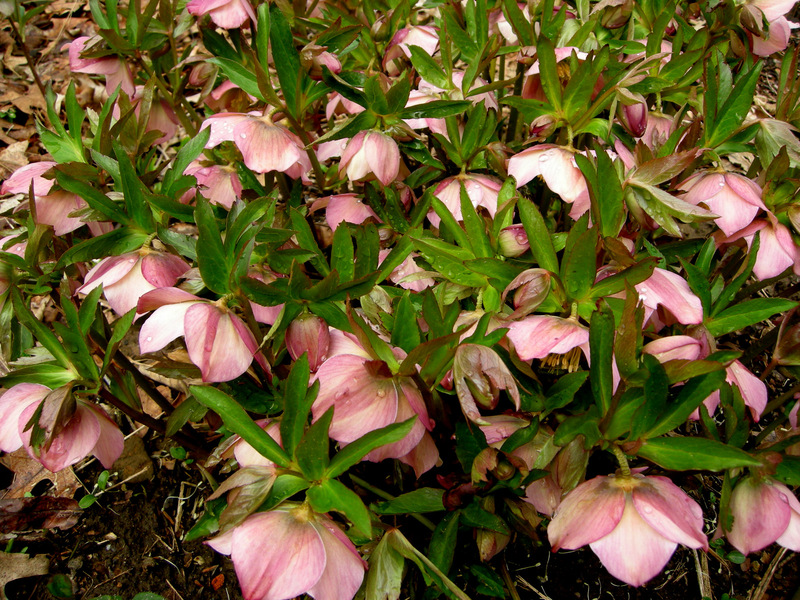 FrostKiss™ ‘Penny’s Pink’ has been around for four years and thrives in my garden. 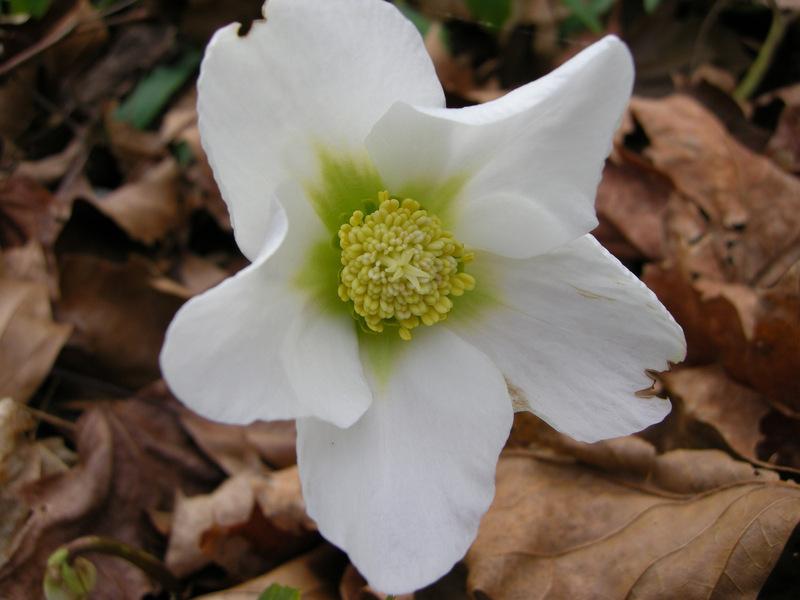 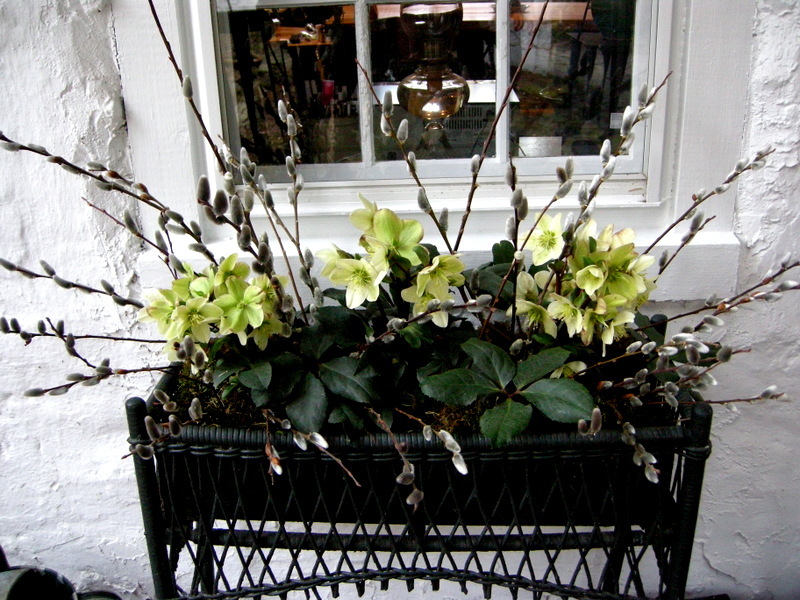 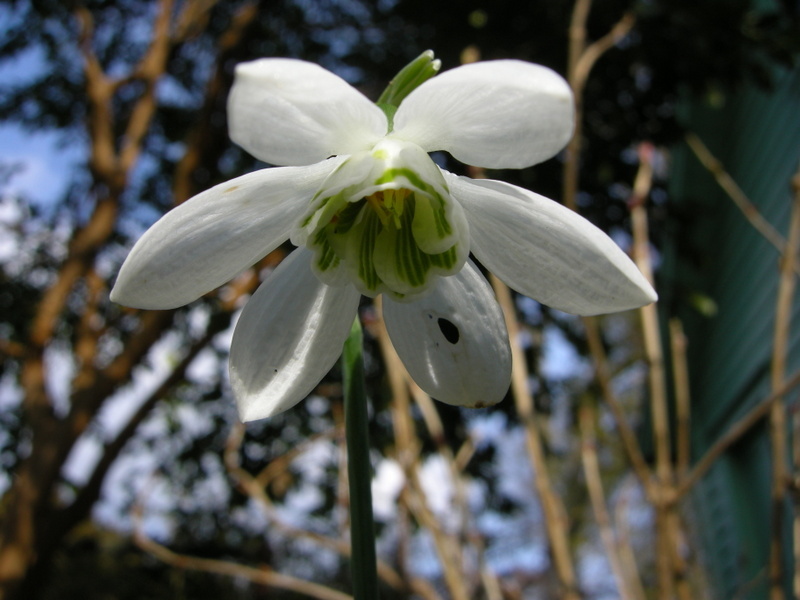 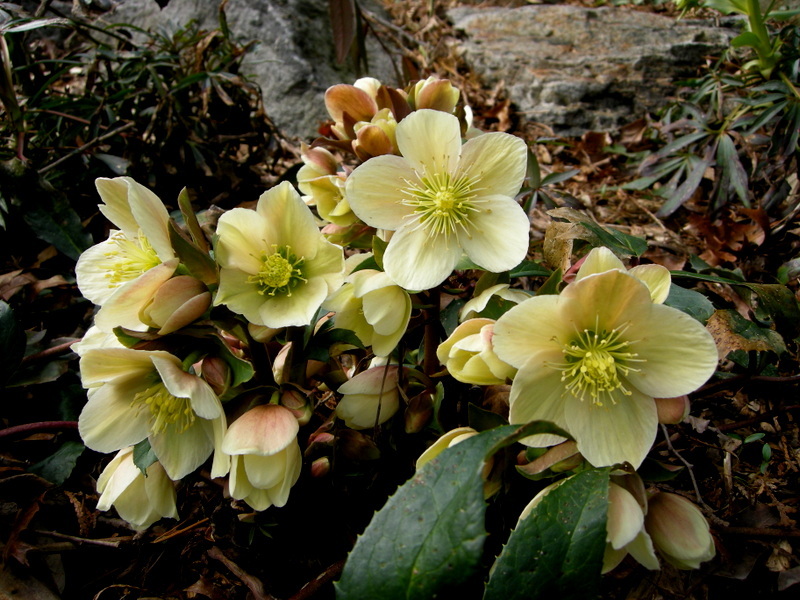 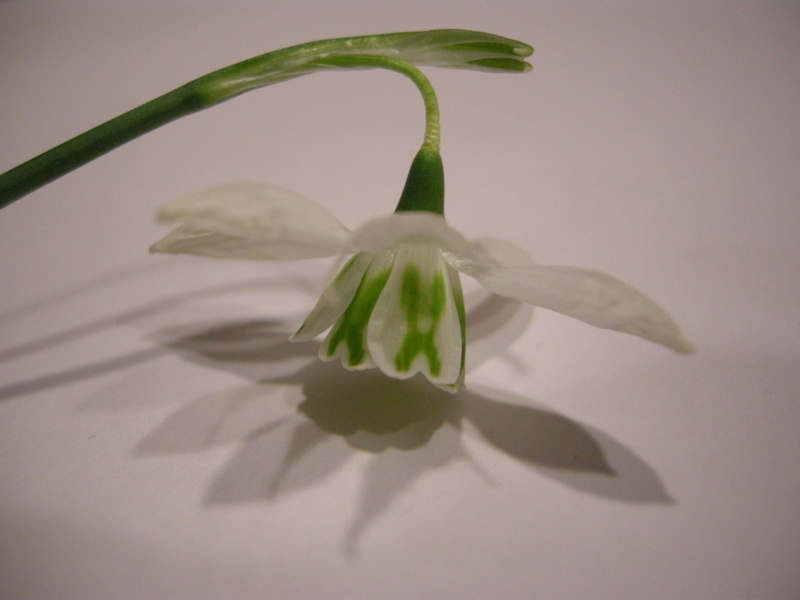 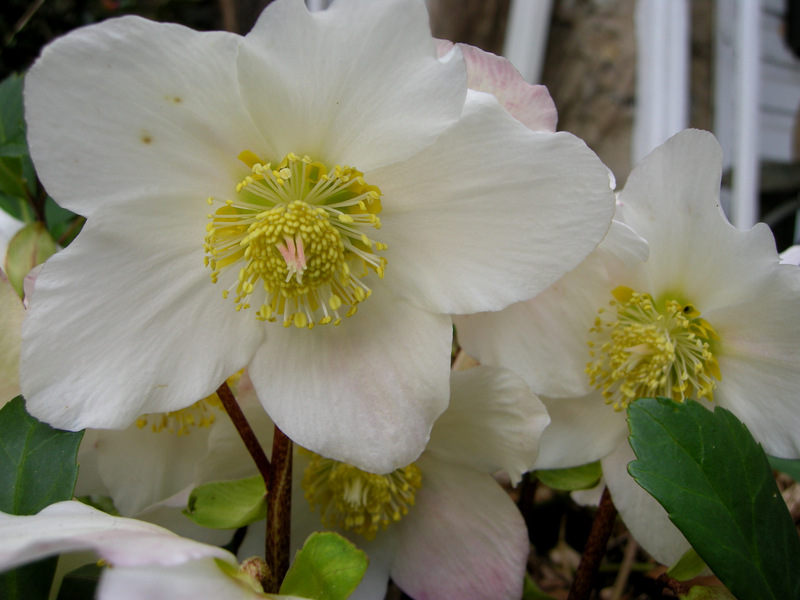 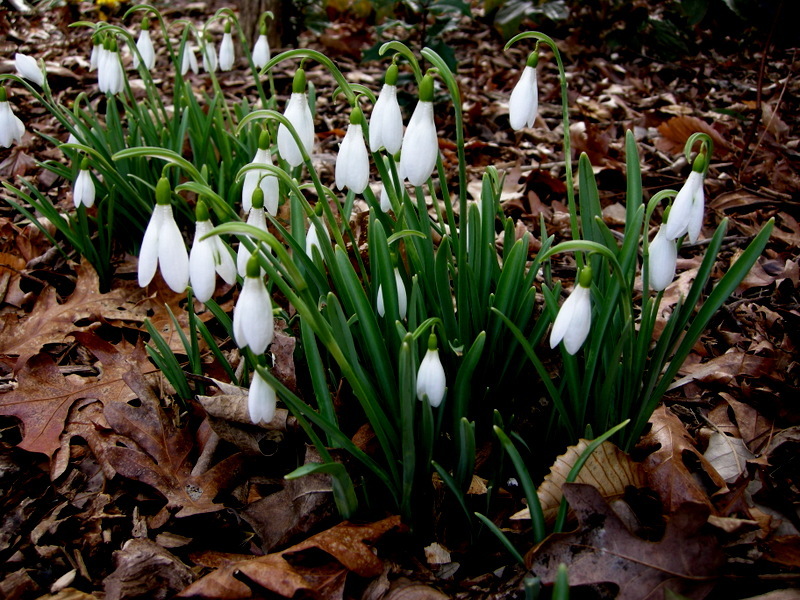 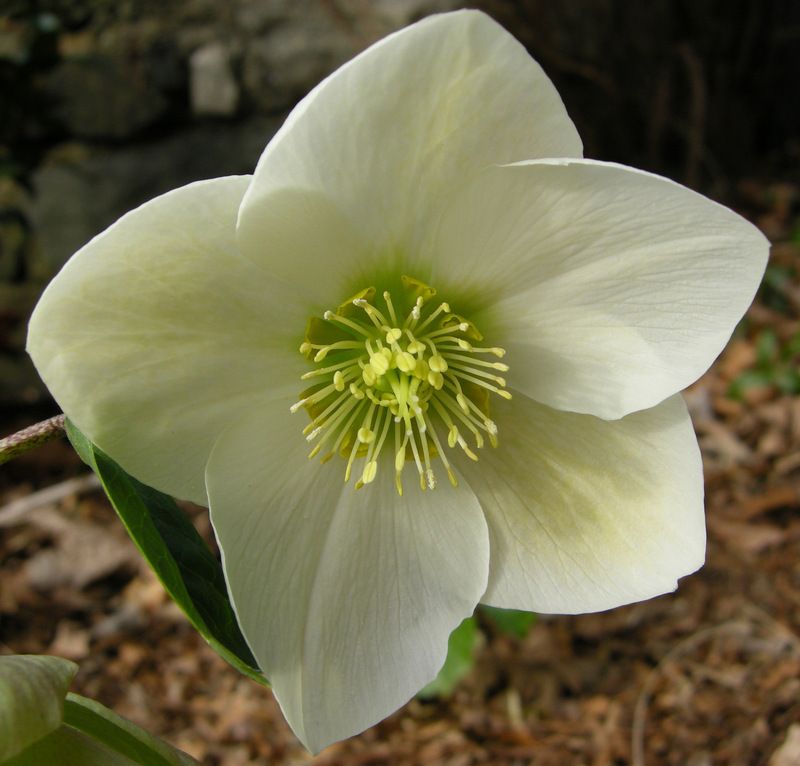 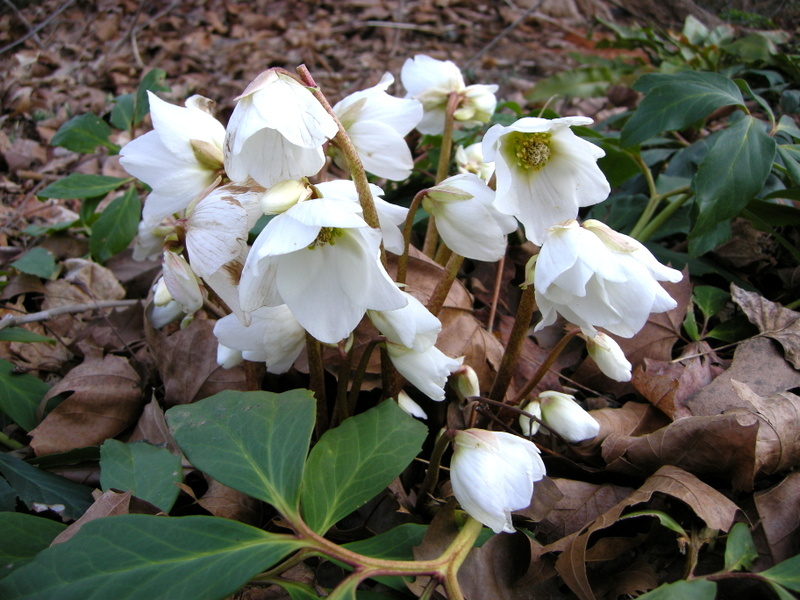 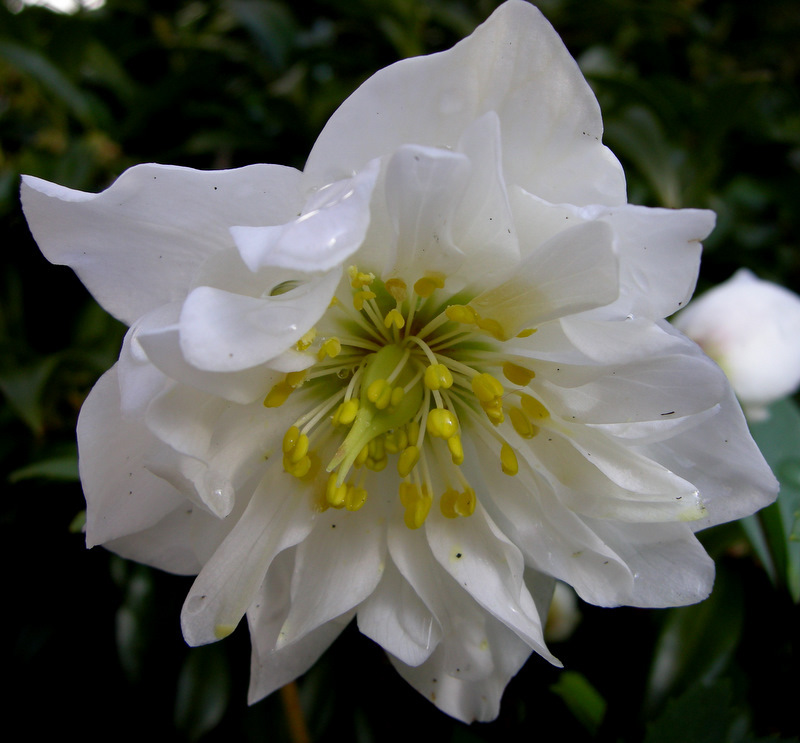 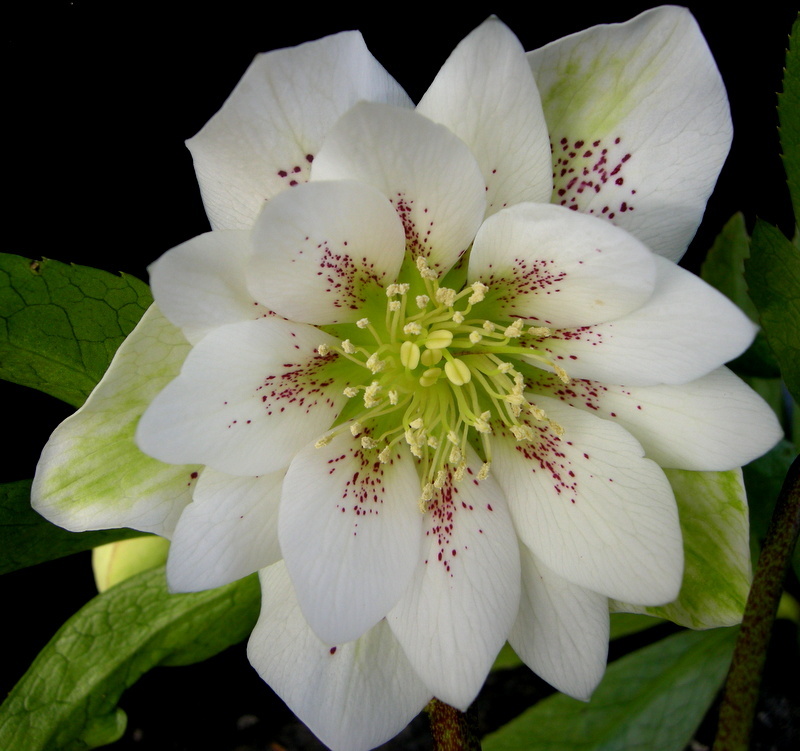 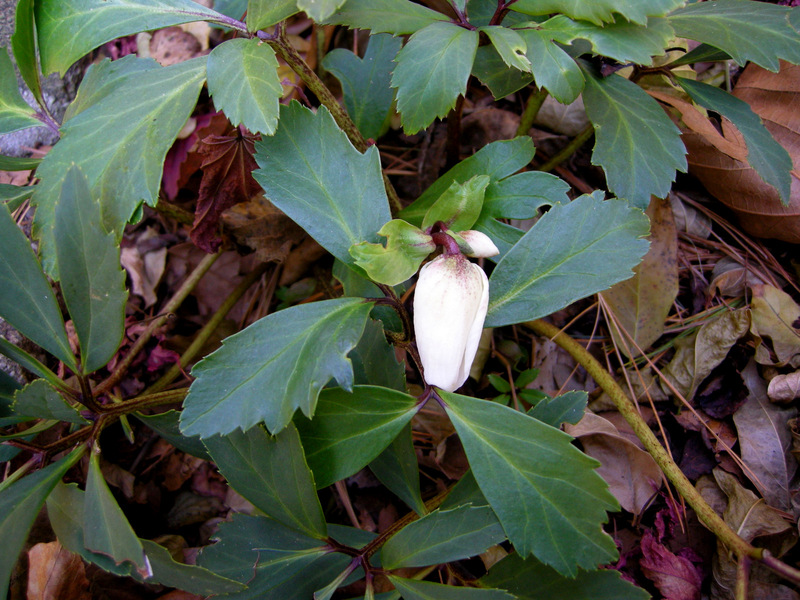 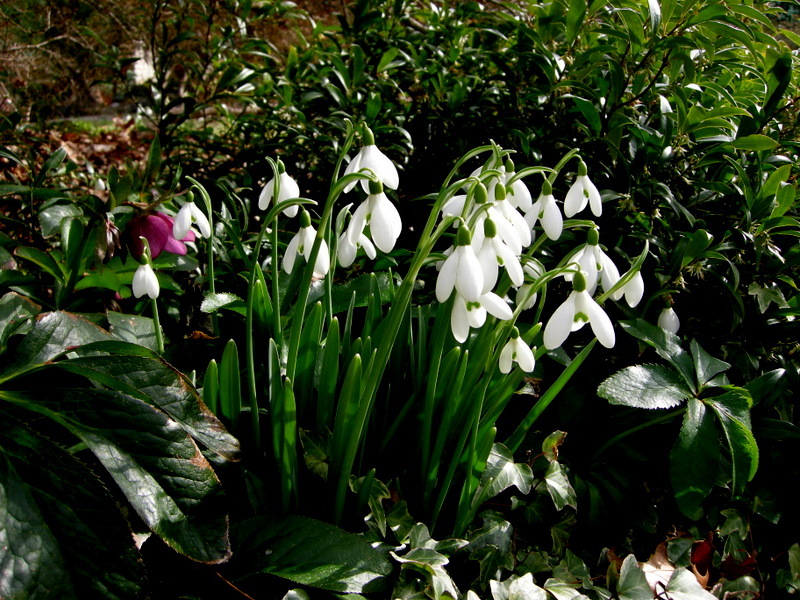 The flowers of FrostKiss™ ‘Molly’s White’ are prolific and lovely, but the best attribute of this hellebore is …. 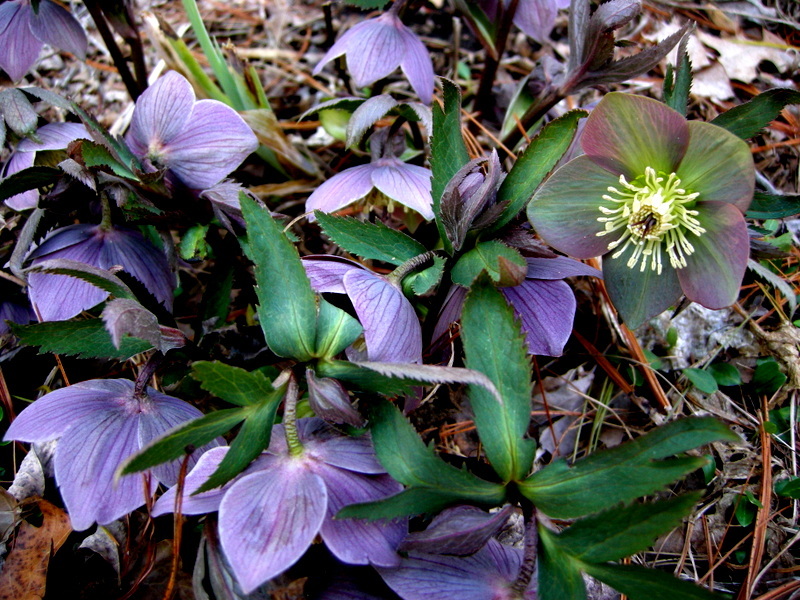 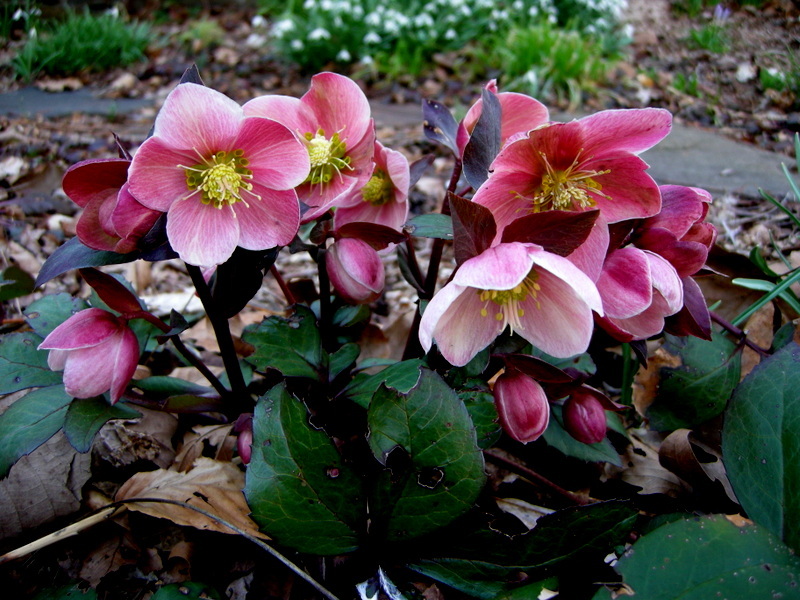 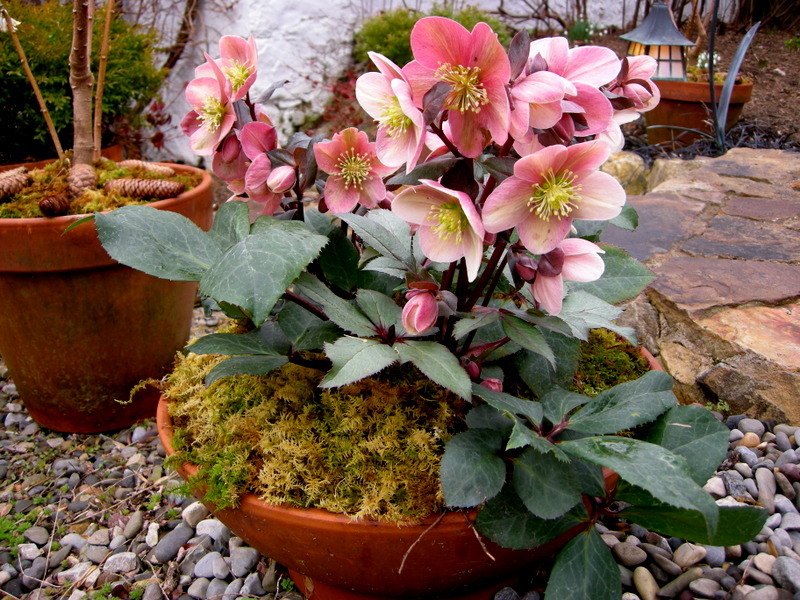 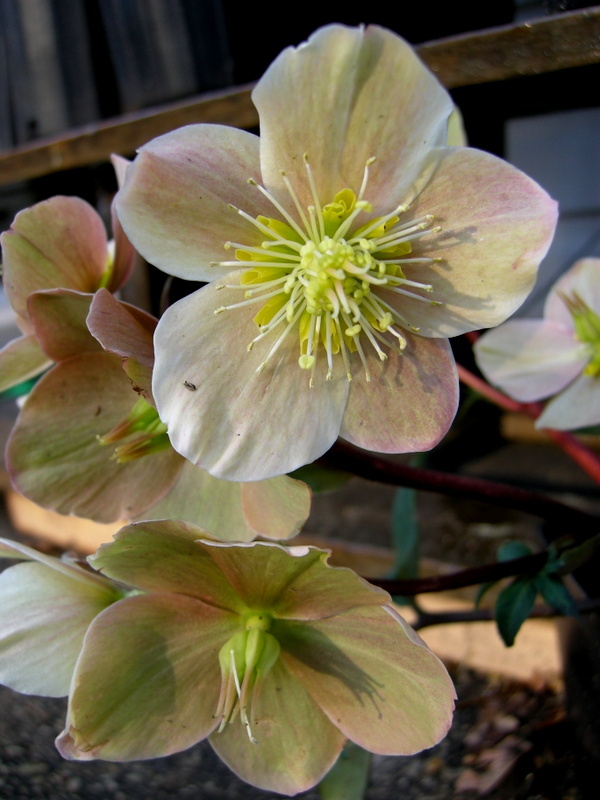 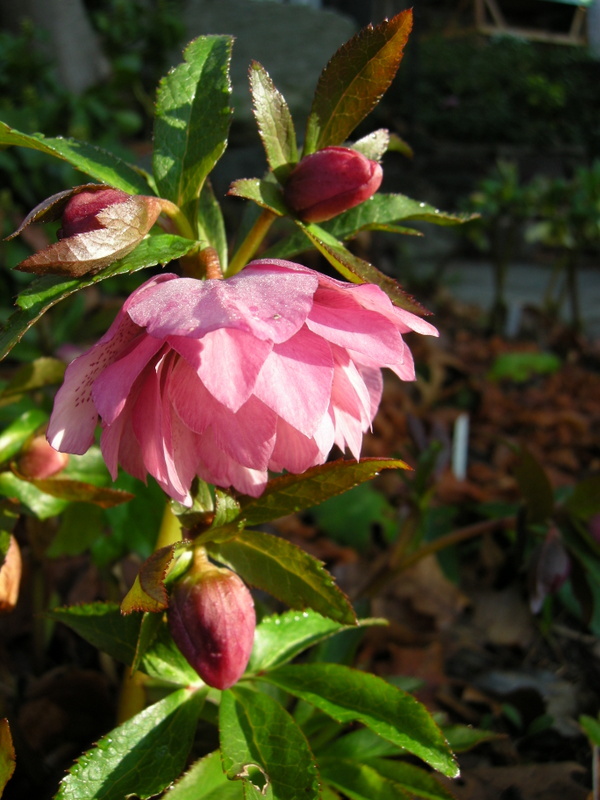 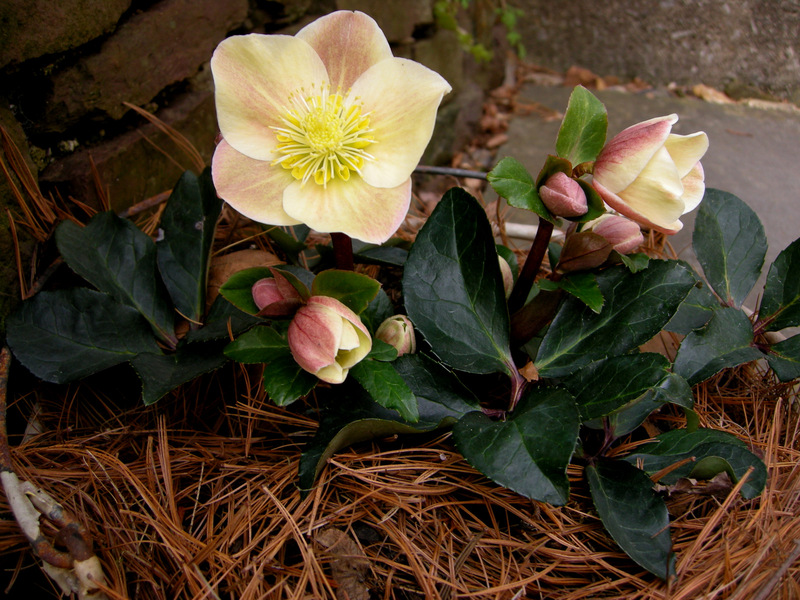 ‘Pink Frost’ is a lovely hellebore, shorter than the FrostKiss™ hellbores and perfect for a smaller garden or space. 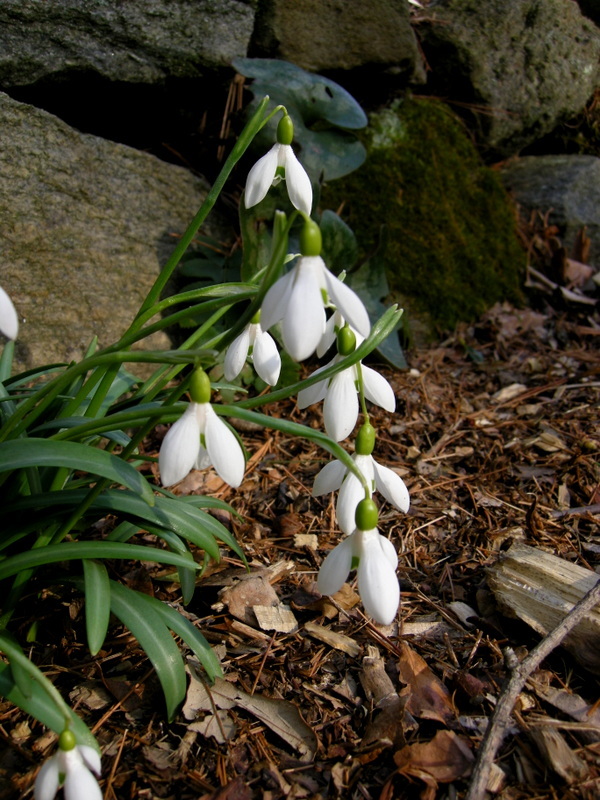 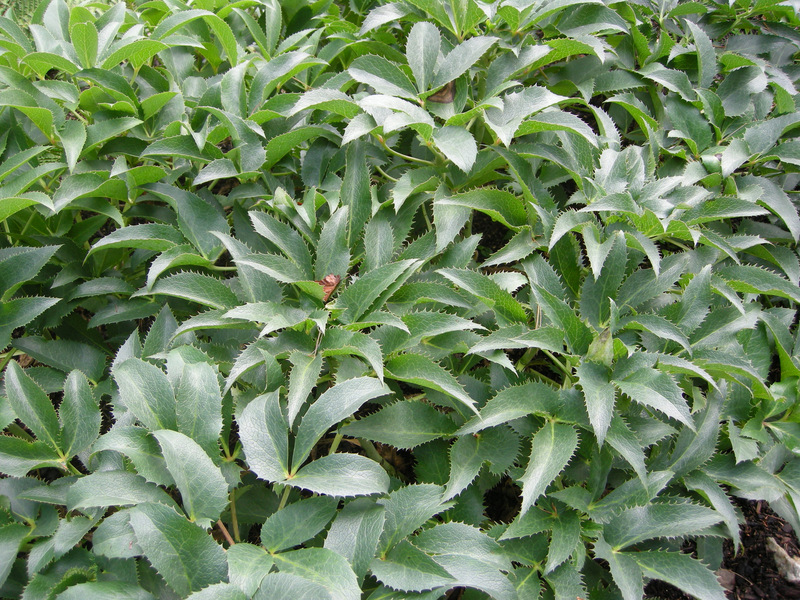 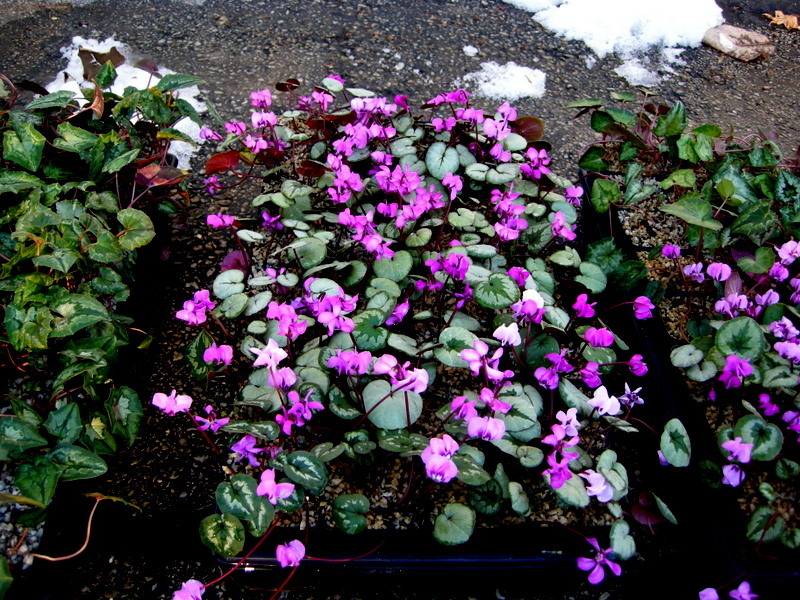 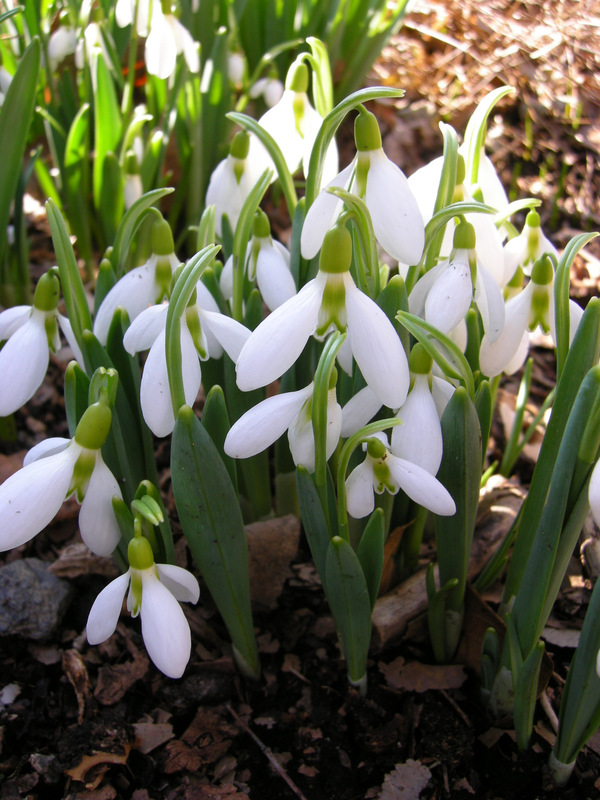 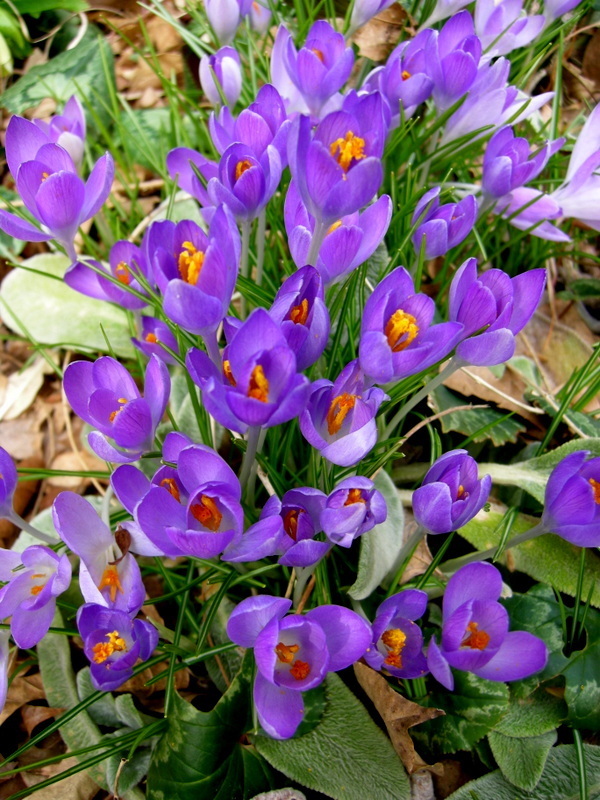 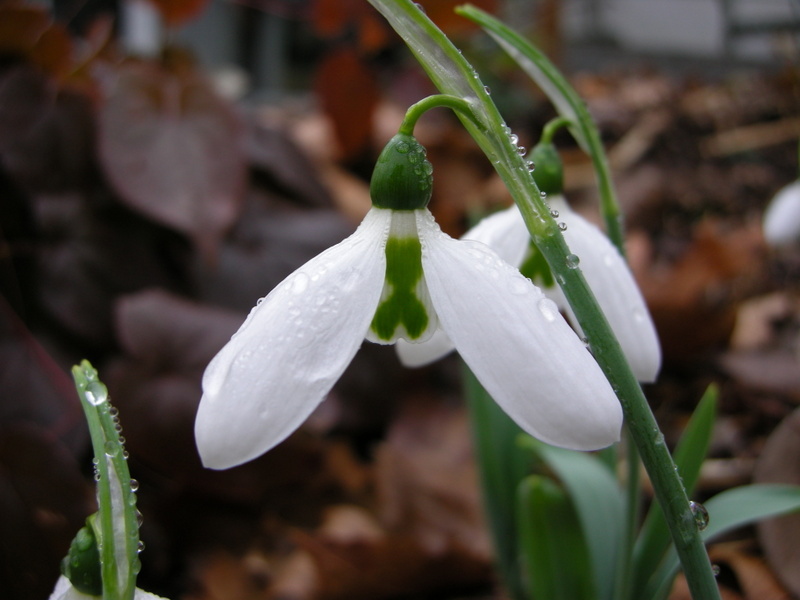 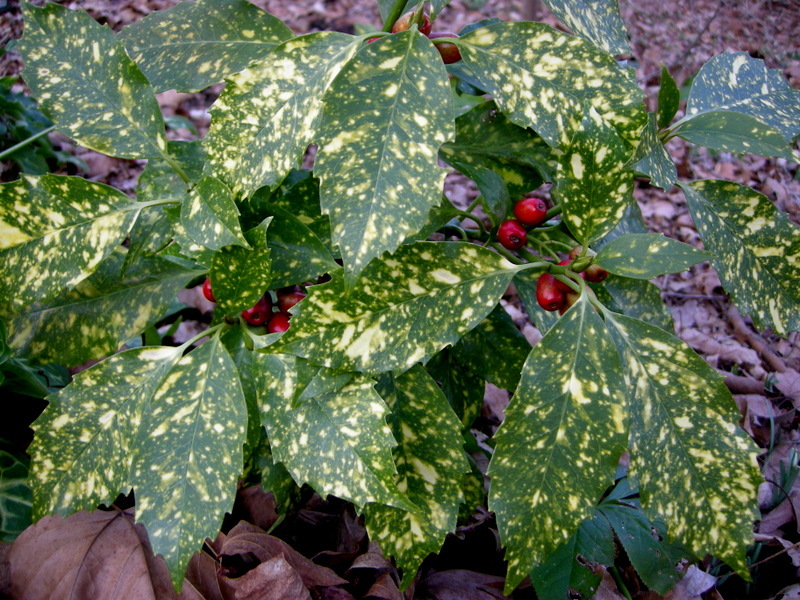 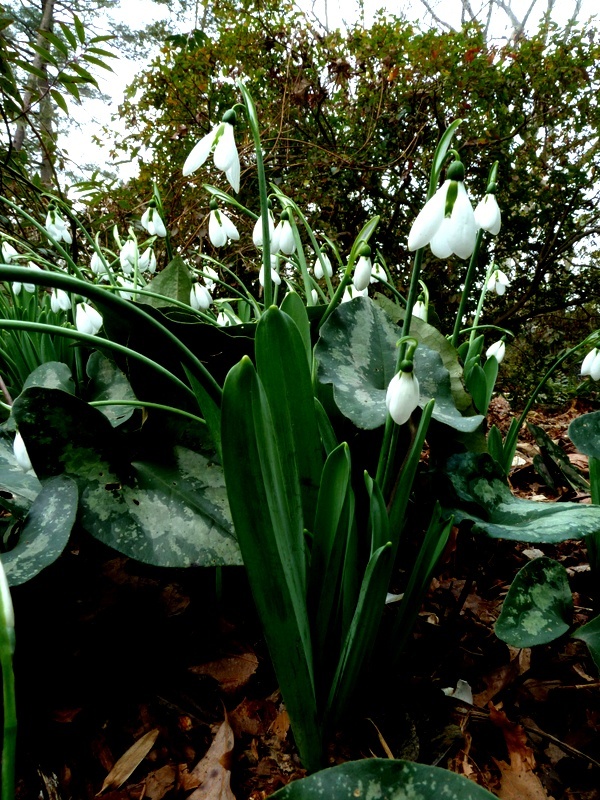 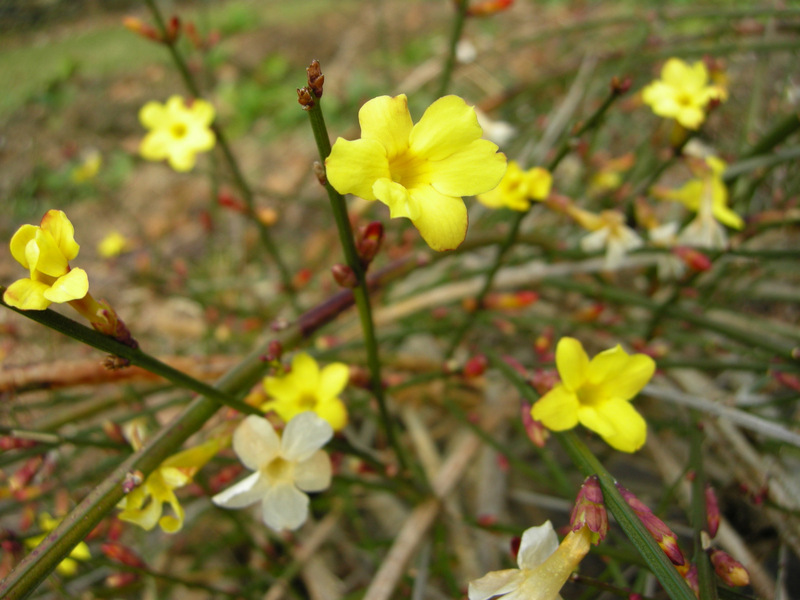 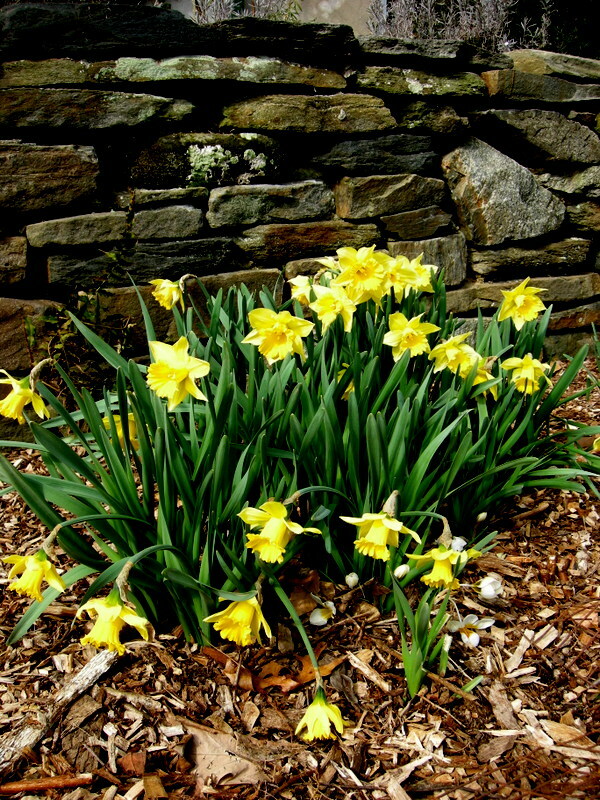 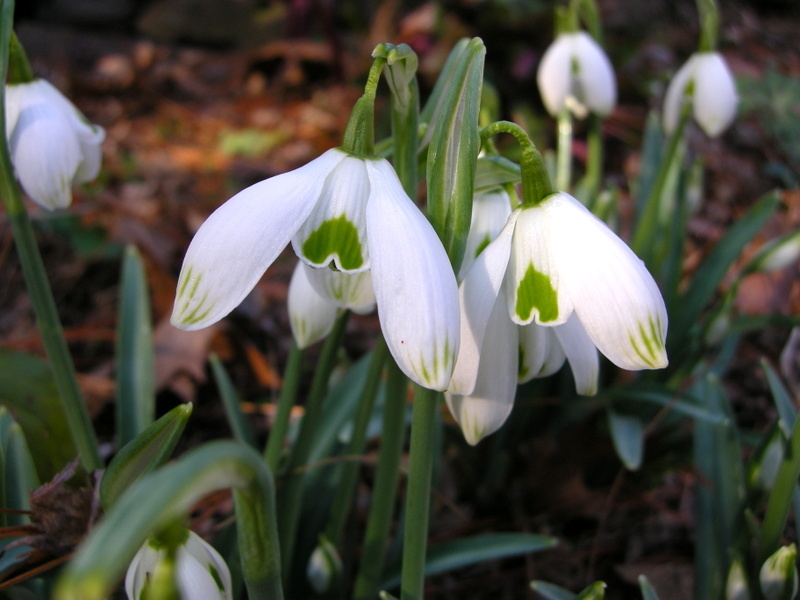 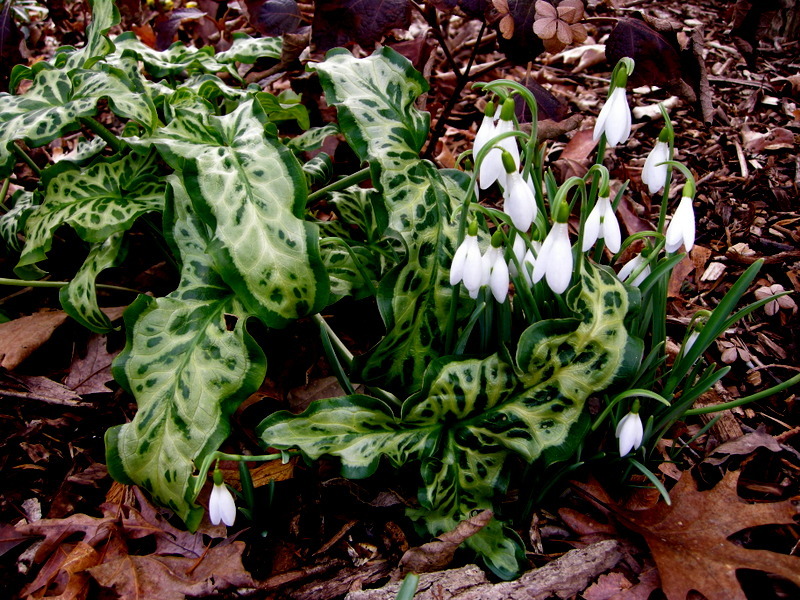 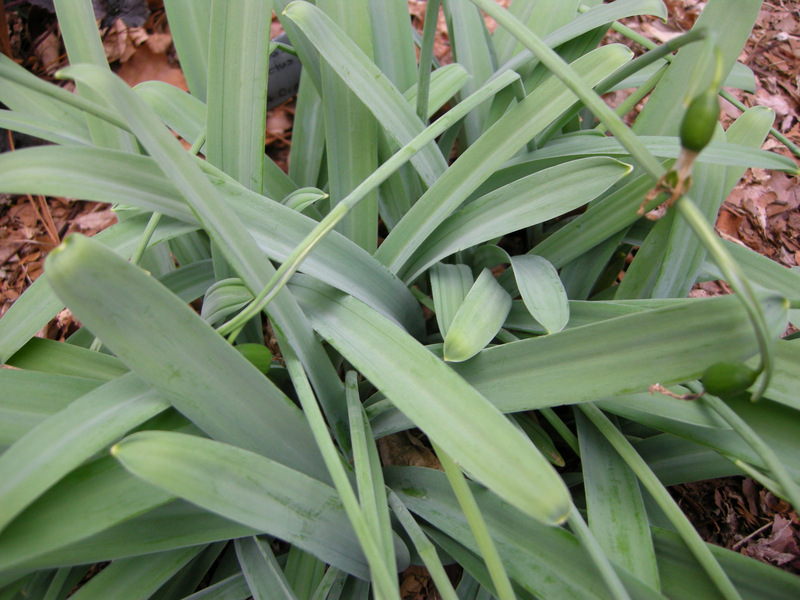 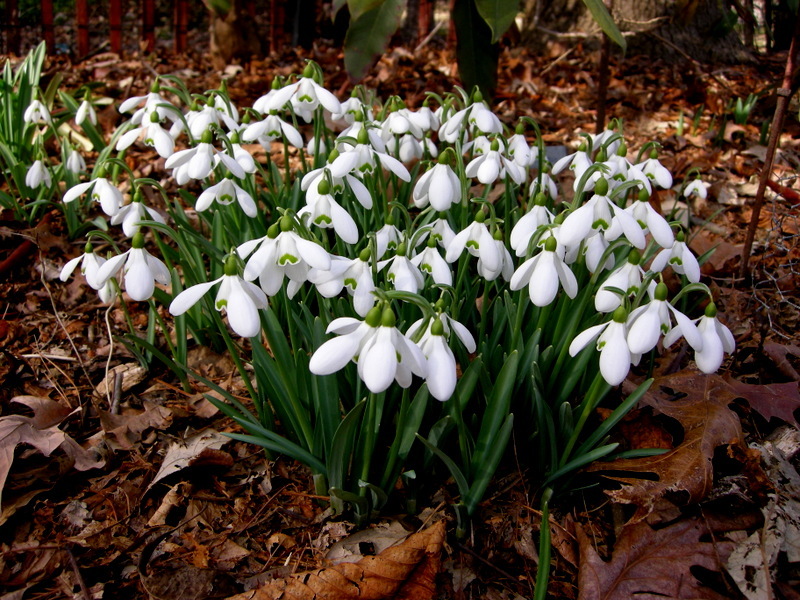 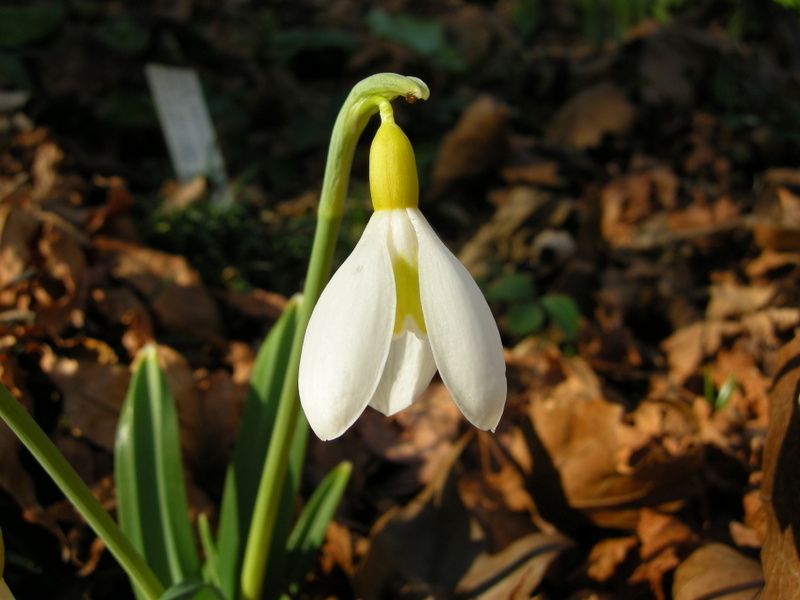 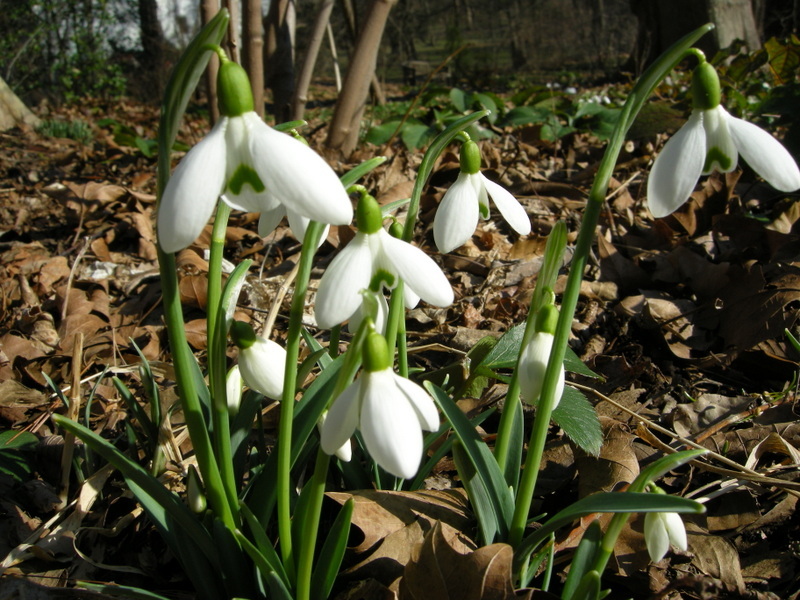 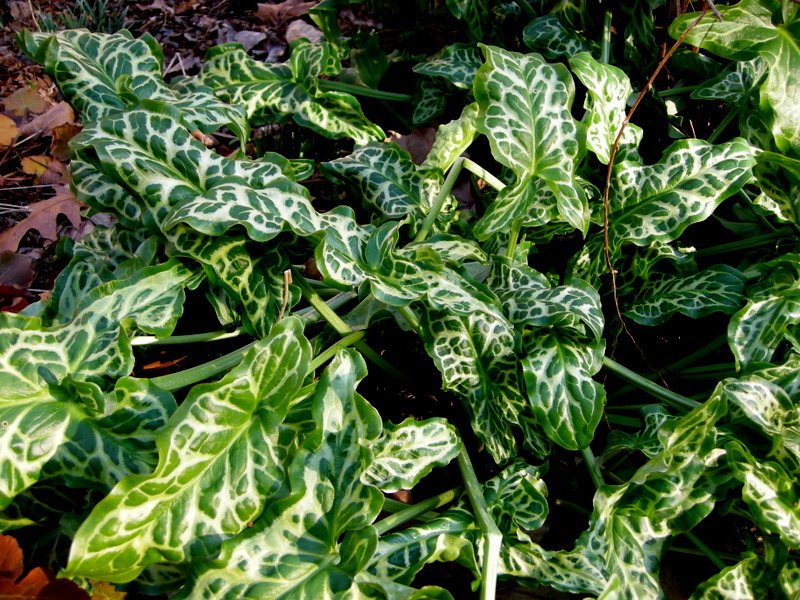 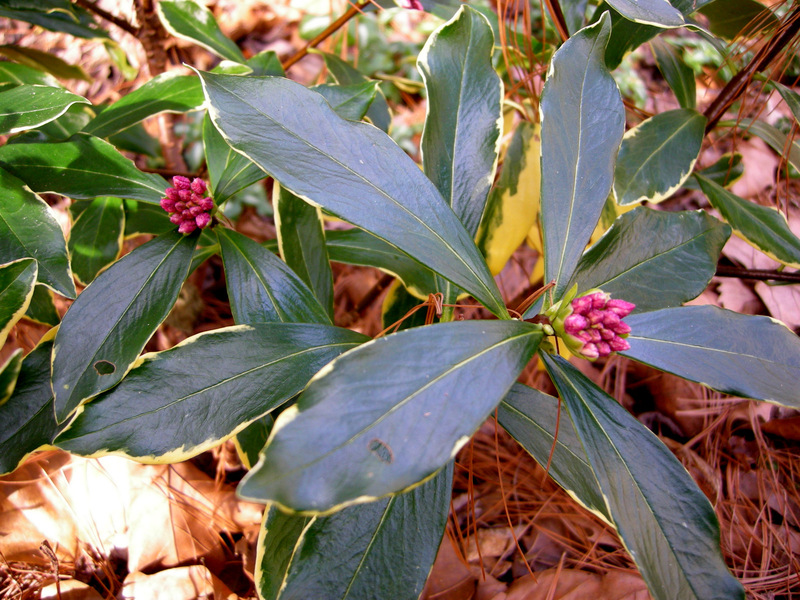 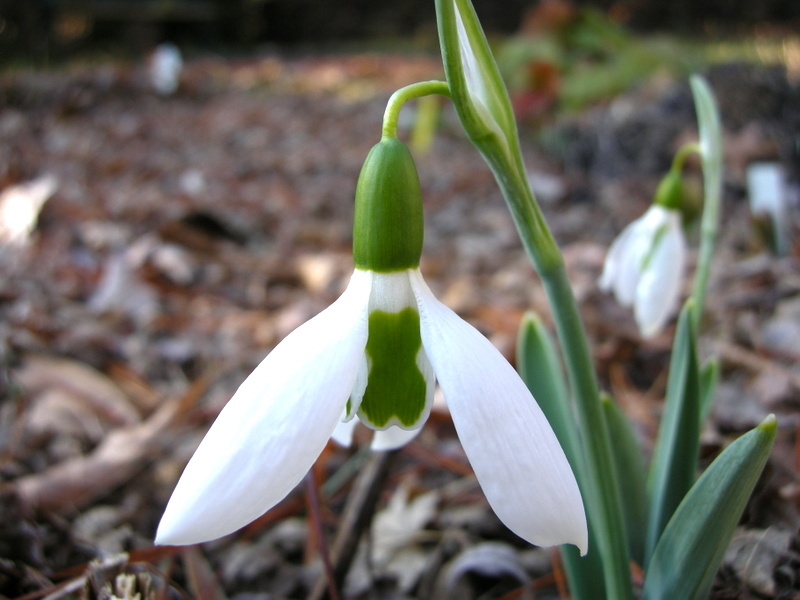 ‘Spring Party’ is also shorter and smaller, but blooms later and has beautiful marbled leaves that last through the winter. 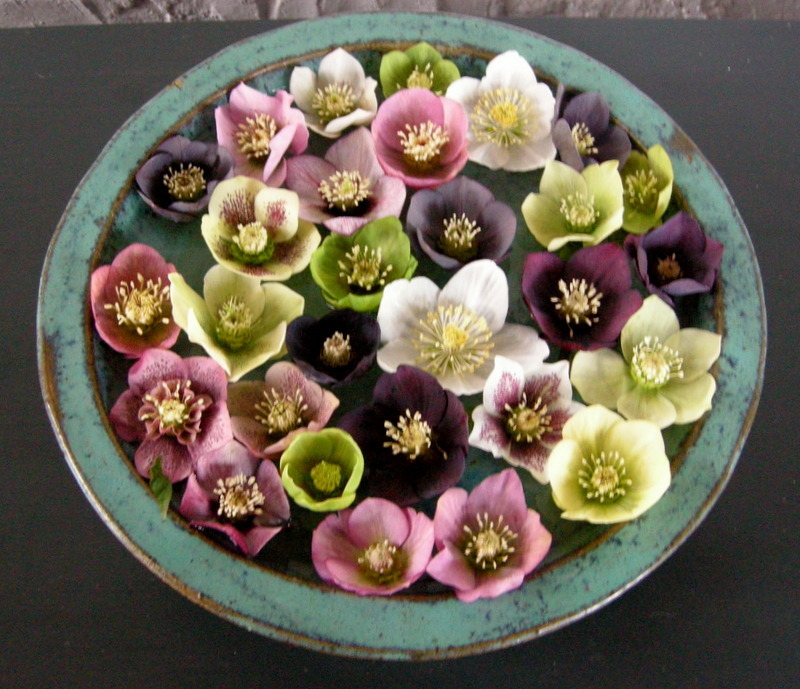 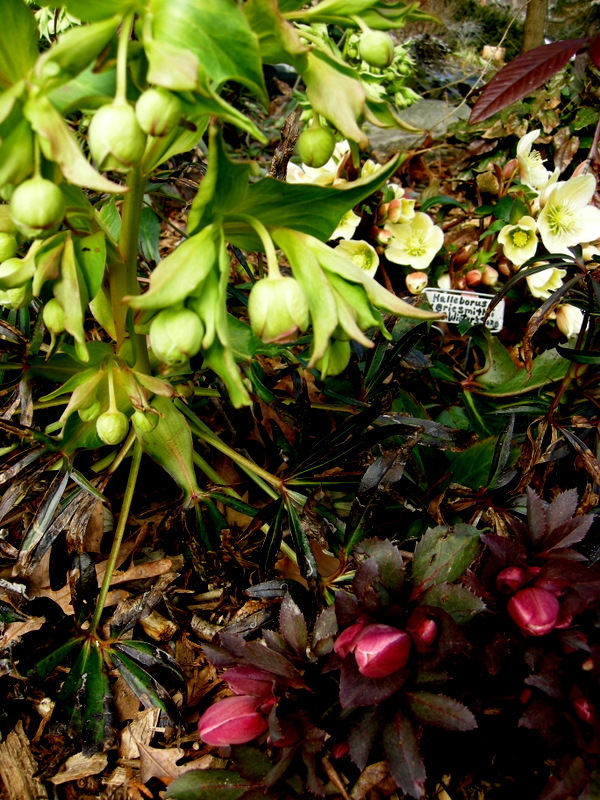 ‘Wedding Bells’ is part of the Wedding Party™ series, a vigorous and well-selected group of double hellebores. 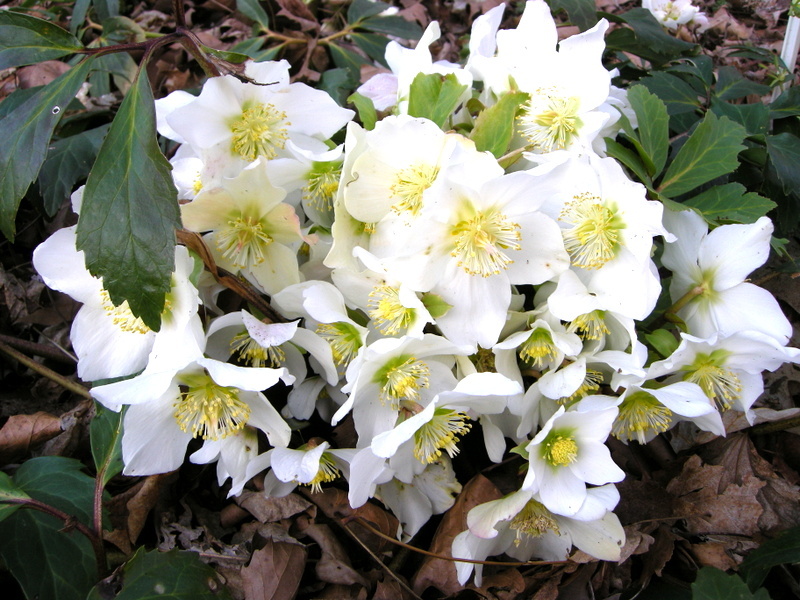 White hellebores really stand out in the garden. 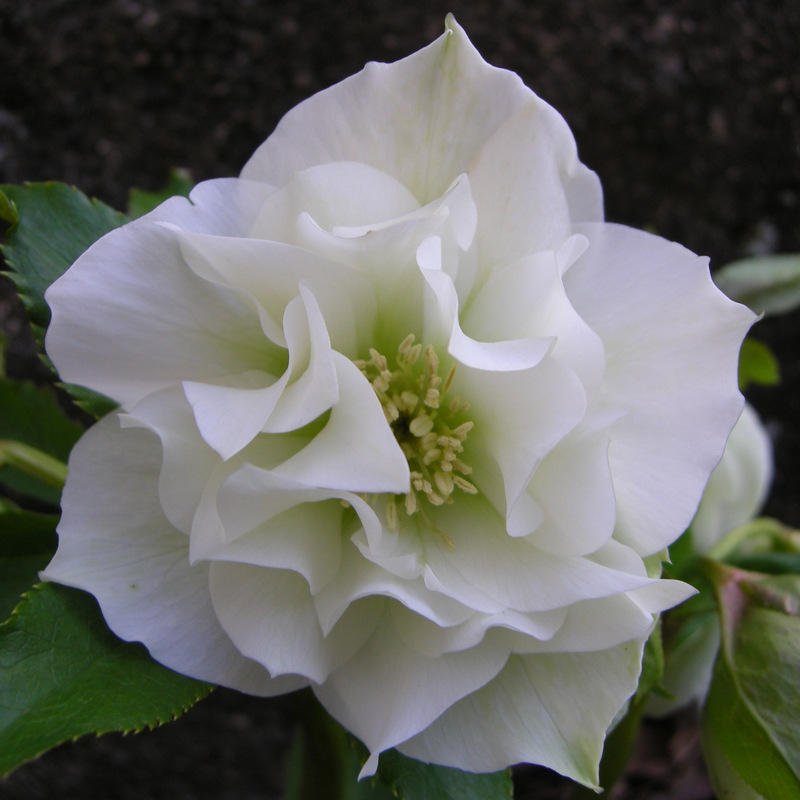 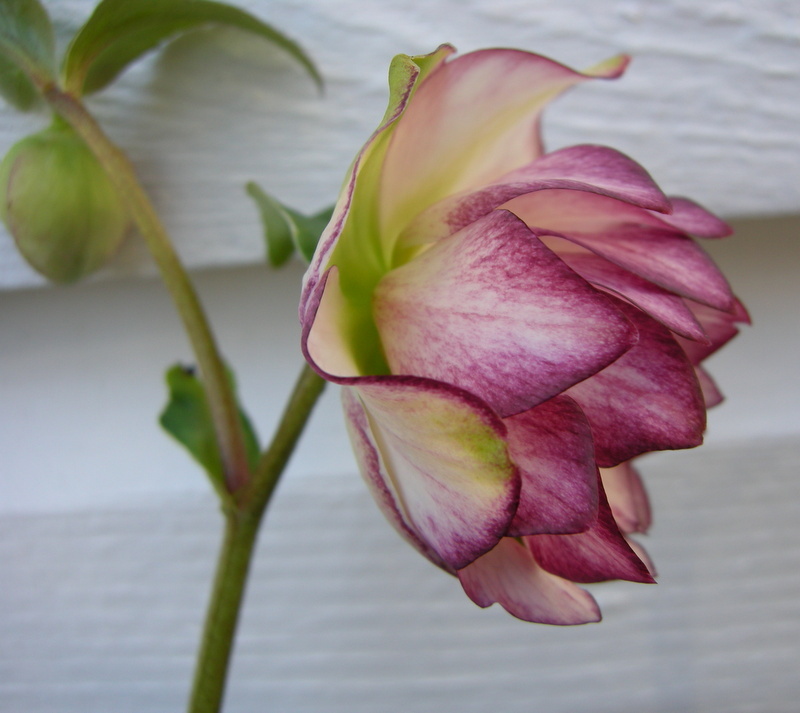 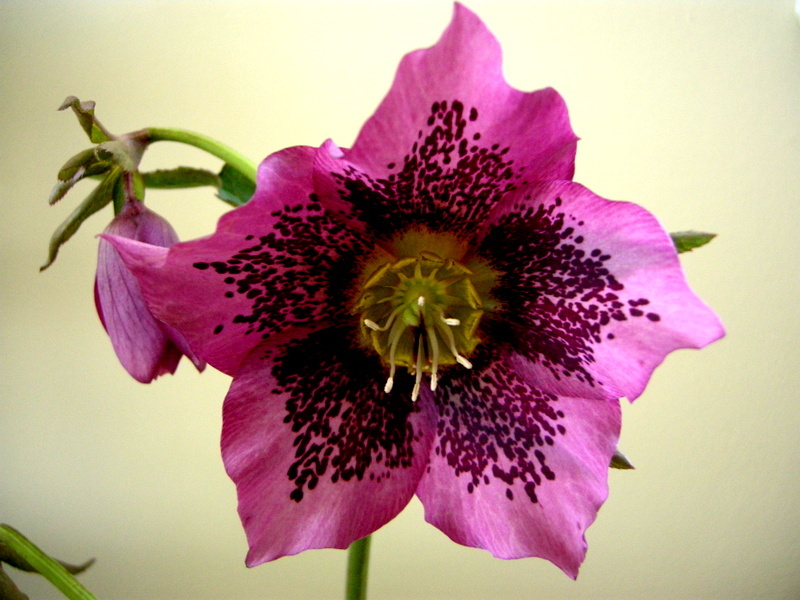 Another Wedding Party™ series hellebore, ‘Flower Girl’. 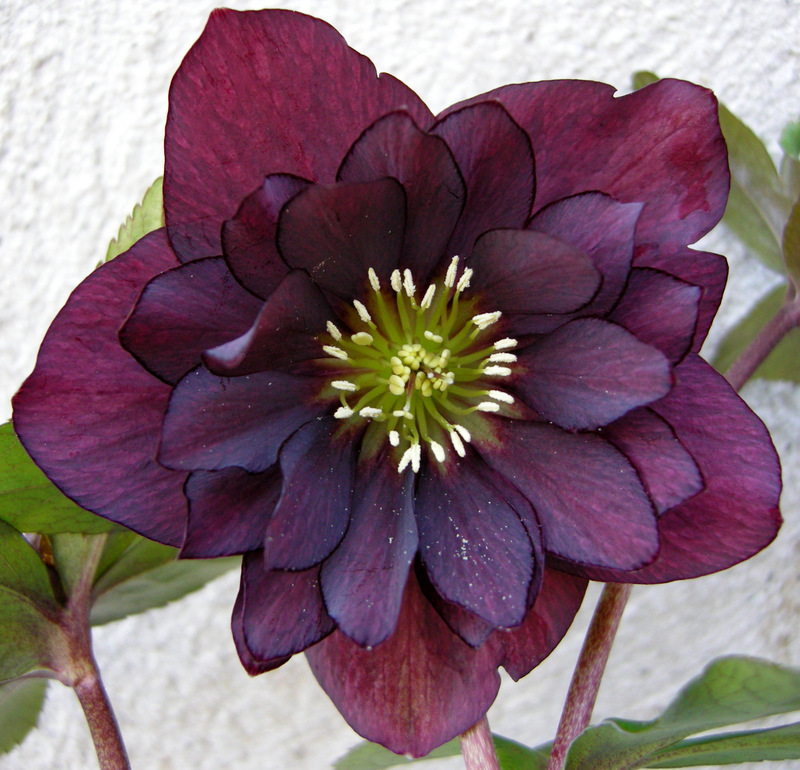 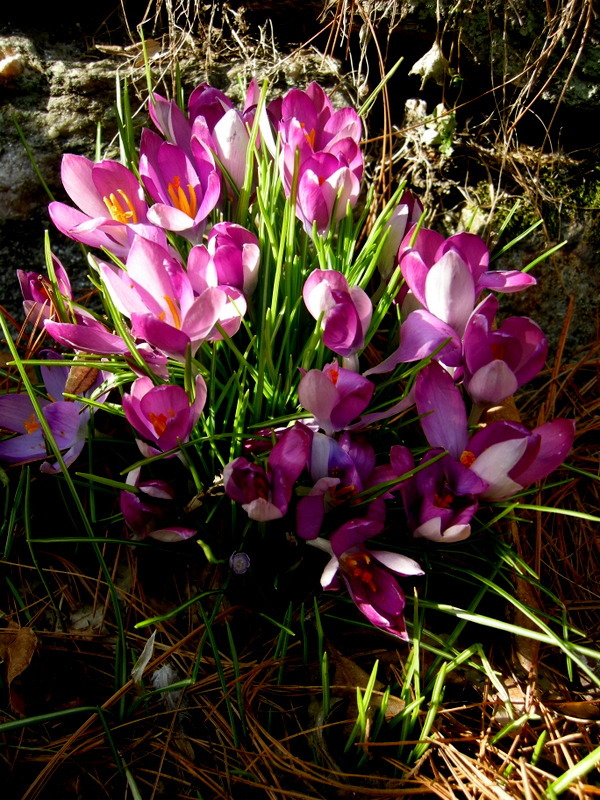 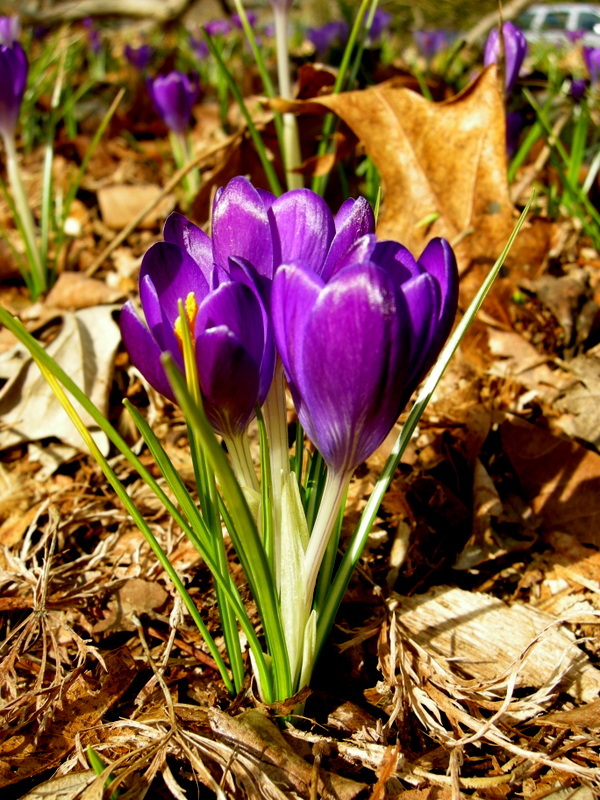 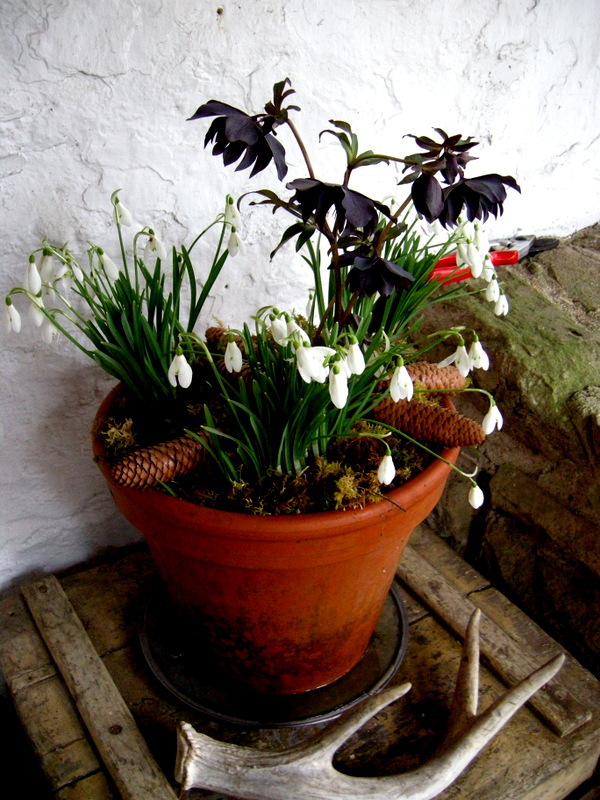 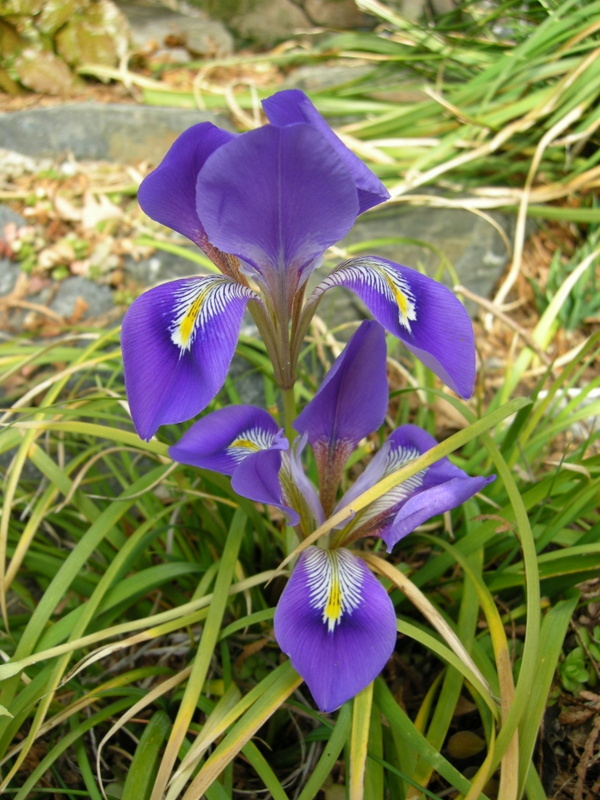 ‘Harlequin Gem’ has a lighter interior with dark purple-black outer petals. 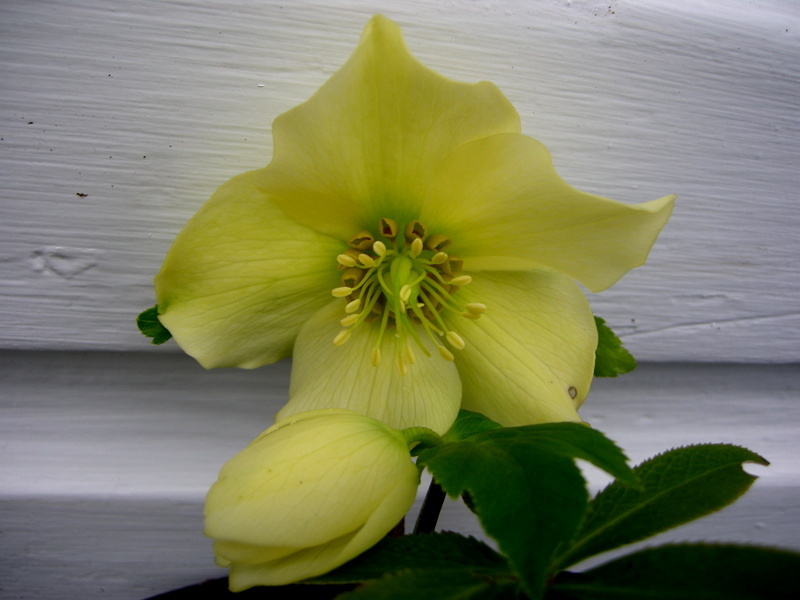 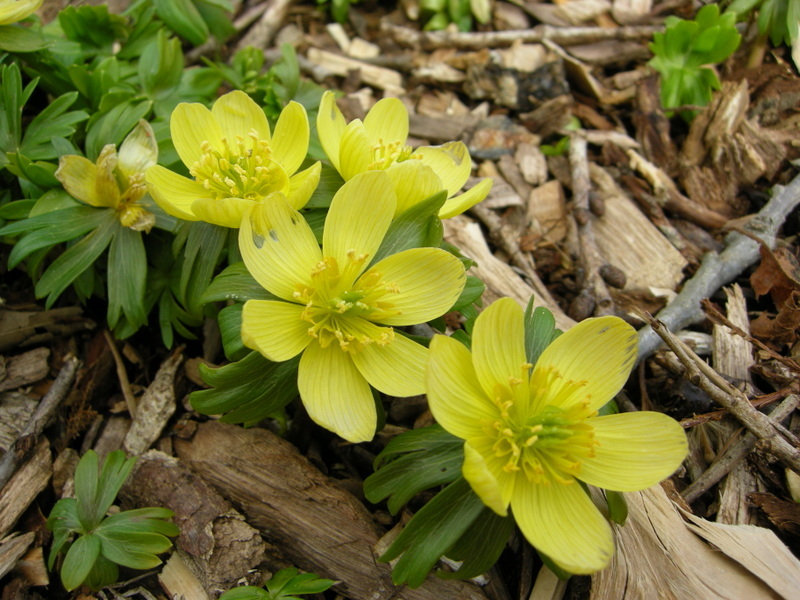 ‘Golden Lotus’, a double yellow hellebore, is prominently featured in my yellow hellebore collection. 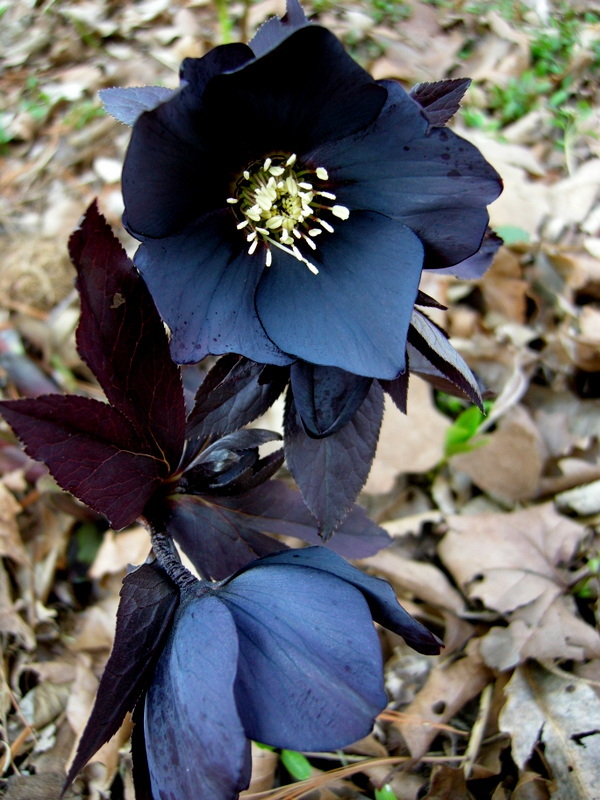 ‘Onyx Odyssey’, a blue-black selection, is outstanding. 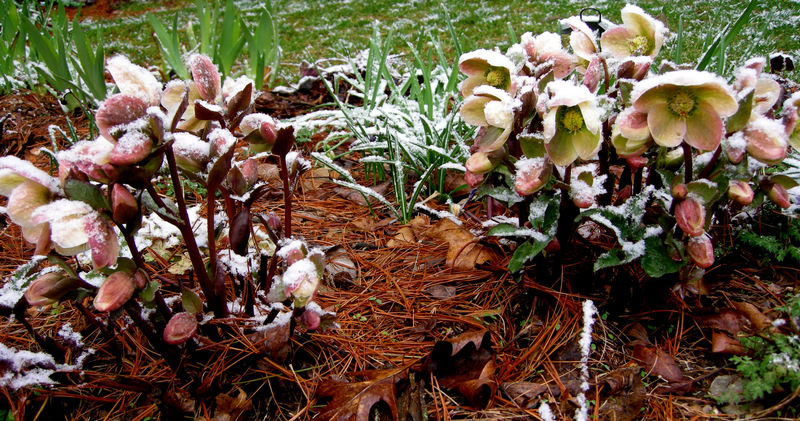 ‘Peppermint Ice’, along my front walk, catches everyone’s eye. 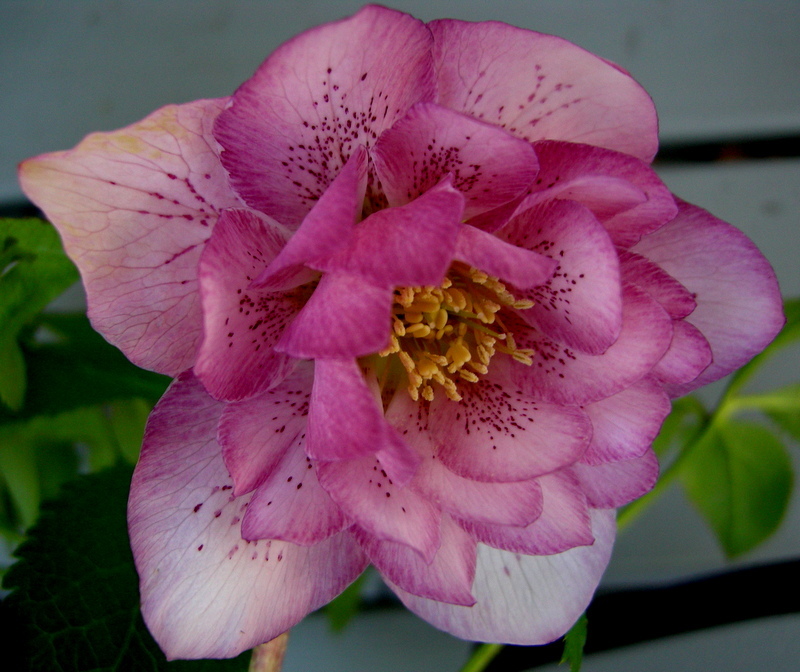 ‘New York Night’ is amazing, look for it around back by the deck. 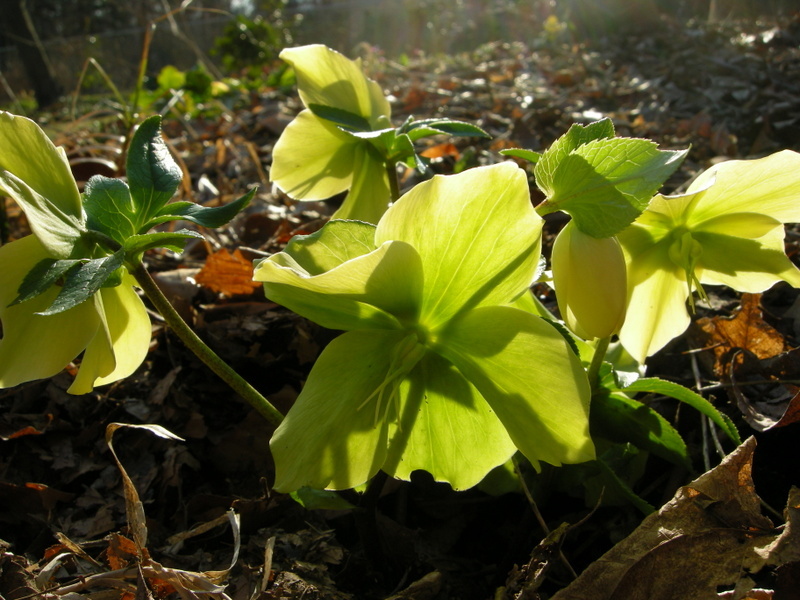 ‘Spanish Flare’ is another prominent feature of my yellow hellebore collection. 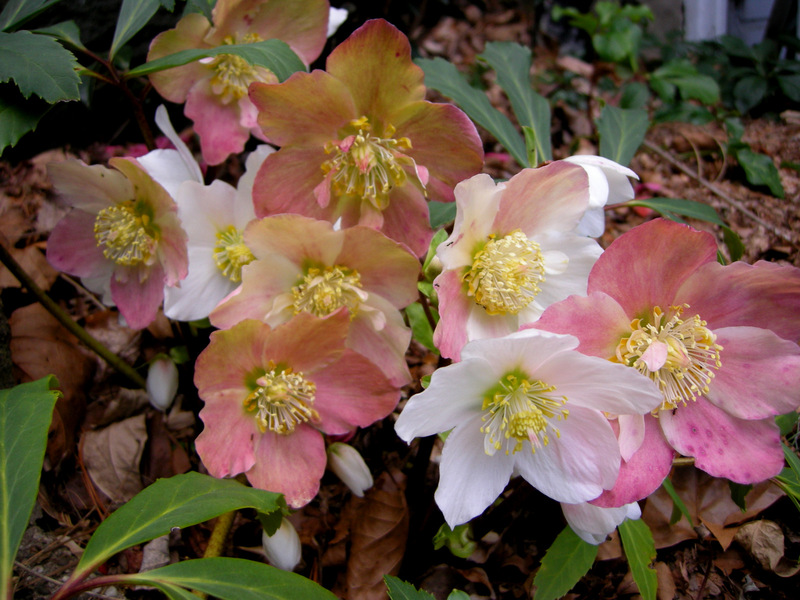 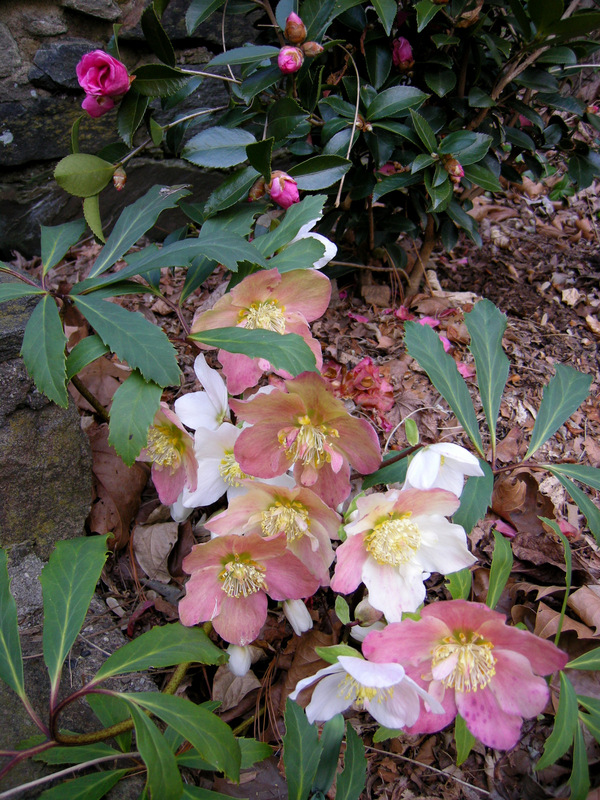 If you are local, I hope you can stop by on Saturday and see all these lovely hellebores in person in my garden. 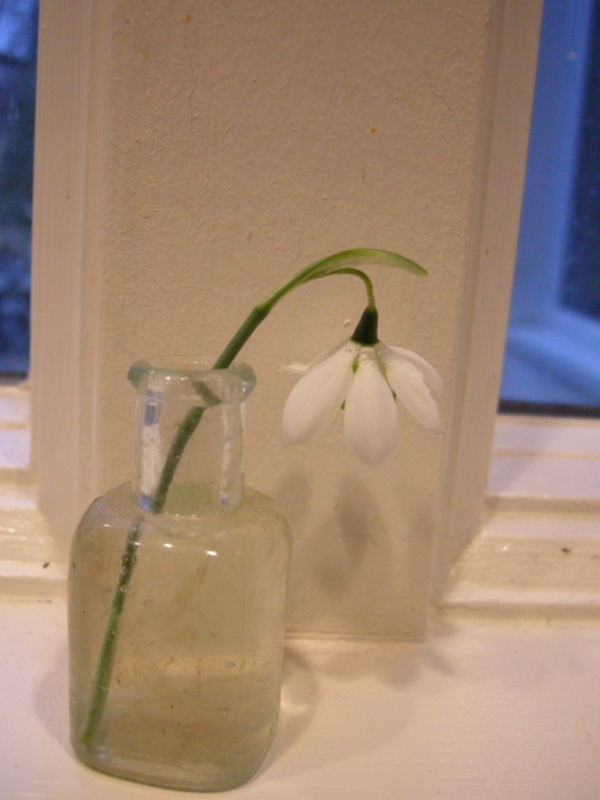 For all my far flung readers, enjoy the photos!